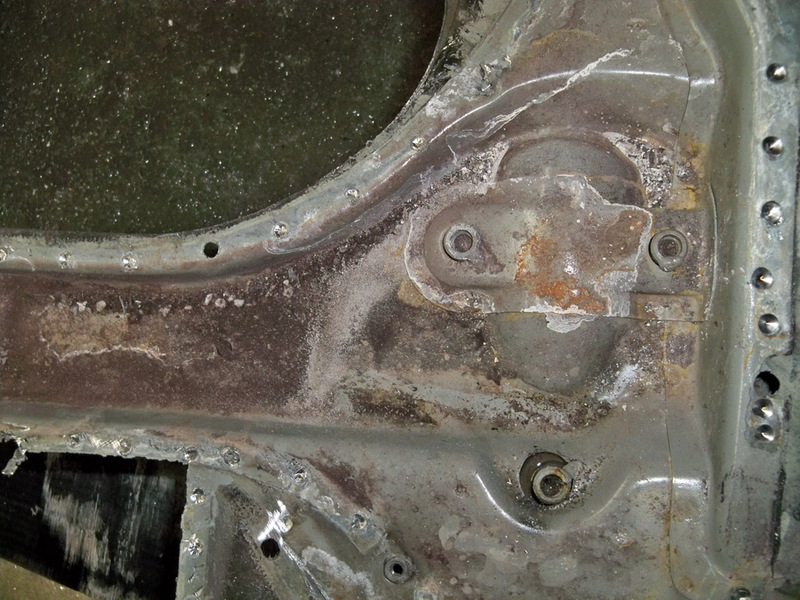 Battery Acid Rust Repairs » Specialty Cars Service Center, Inc. 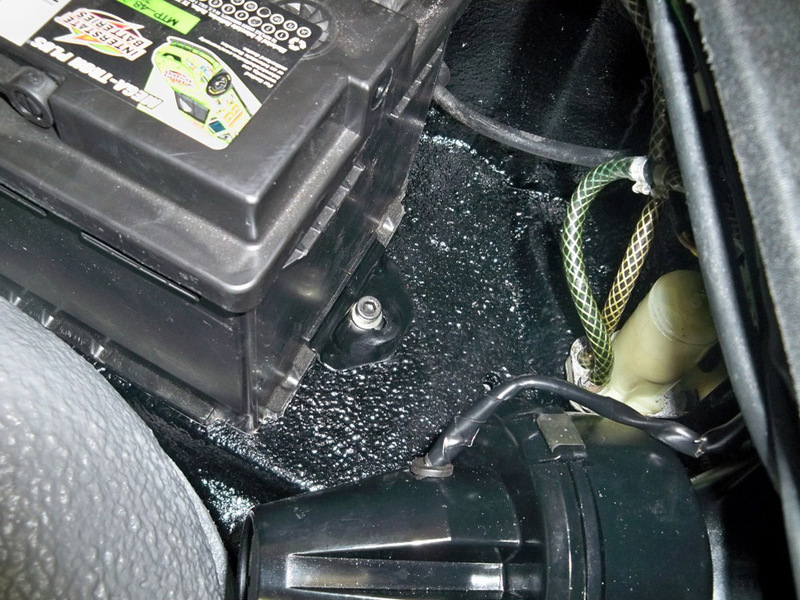 Acid batteries have the tendency to boil over from either being overcharged or overfilled with acid. 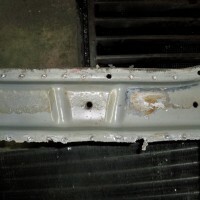 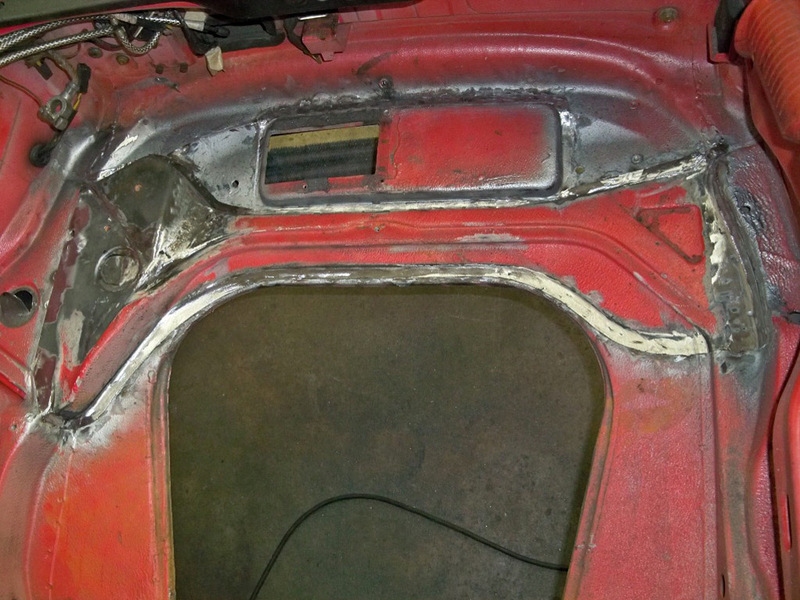 If the problem is treated properly, rust repairs generally are not needed down the road. 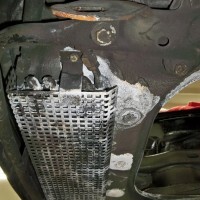 However, many times battery acid is left on the metal of the car’s front pan, and over time it begins to corrode and rot. 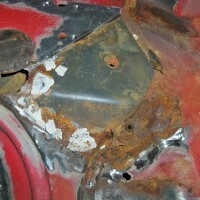 By this point, proper metal fabrication and replacement is needed. 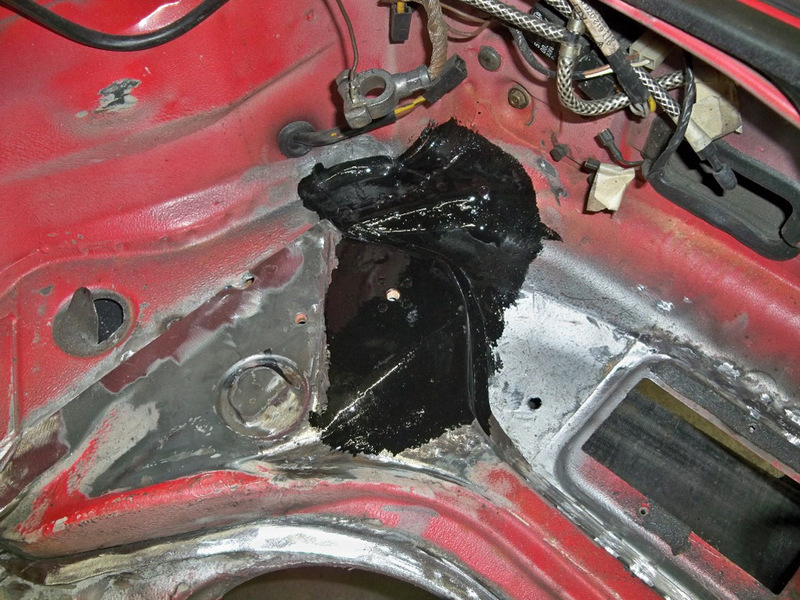 We highly recommend replacing your acid battery with a gel battery, as these cannot boil over. 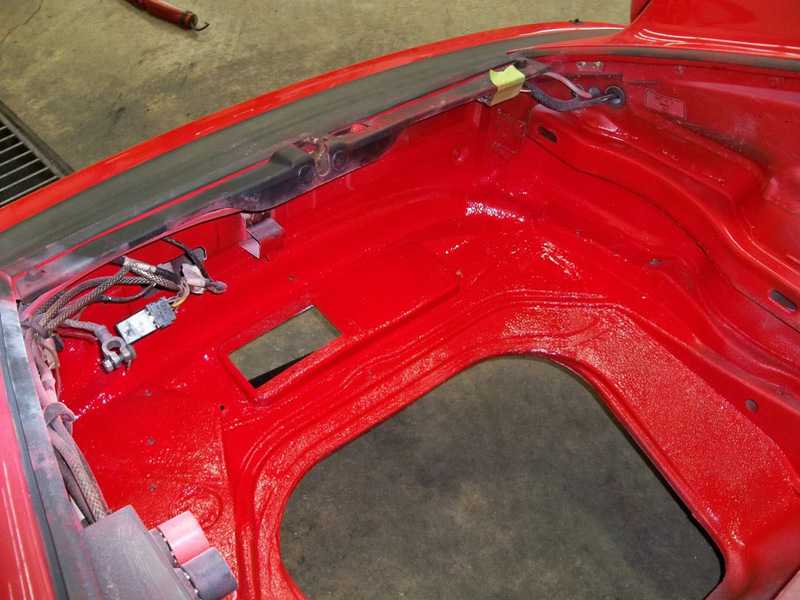 By doing this early on, you can prevent the rust and corrosion that results and therefore increase the value of your Porsche by maintaining its original sheet metal. 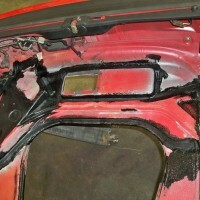 However, sometimes the damage has already occurred and proper treatment is needed. 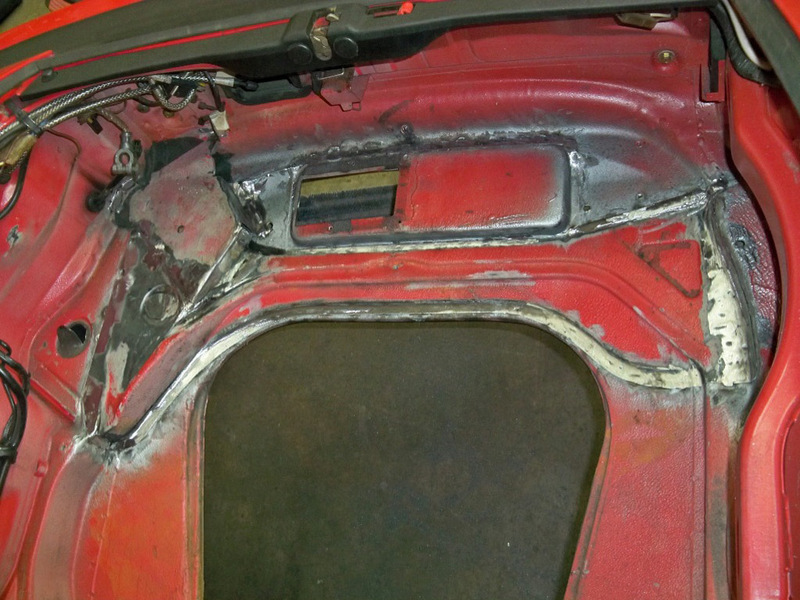 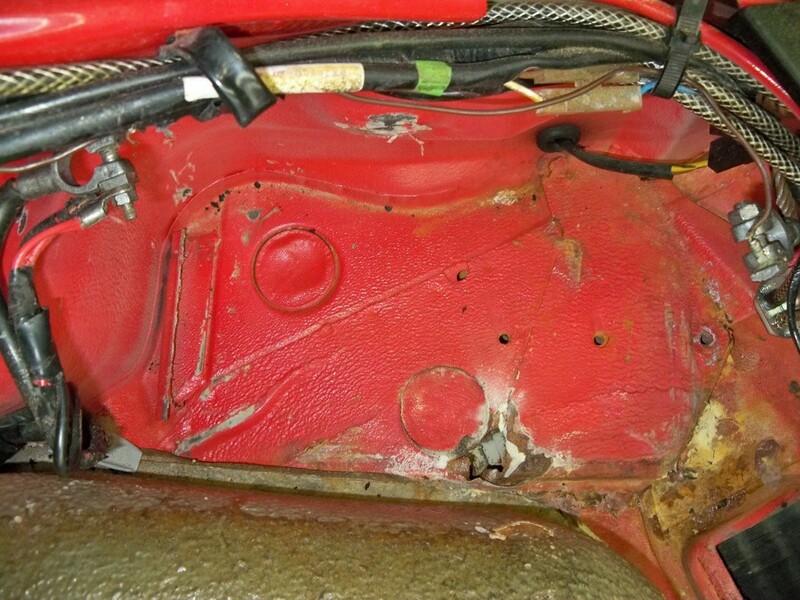 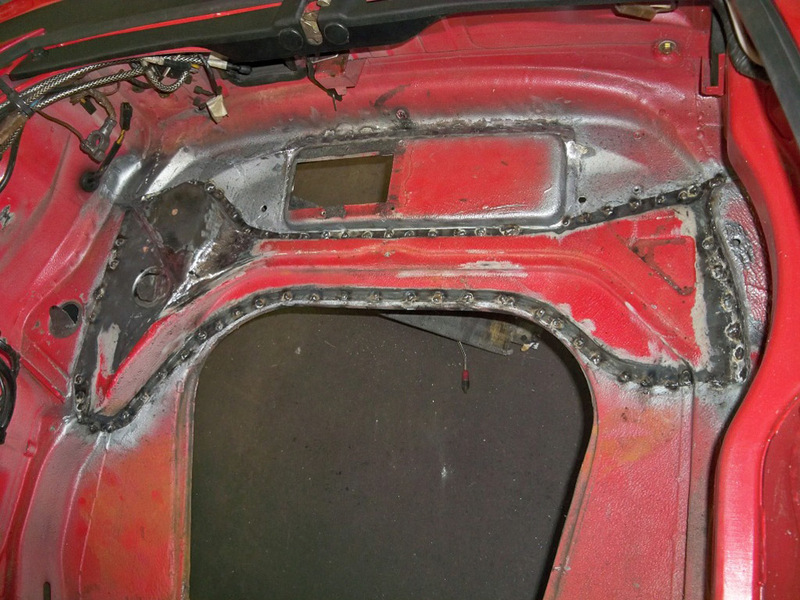 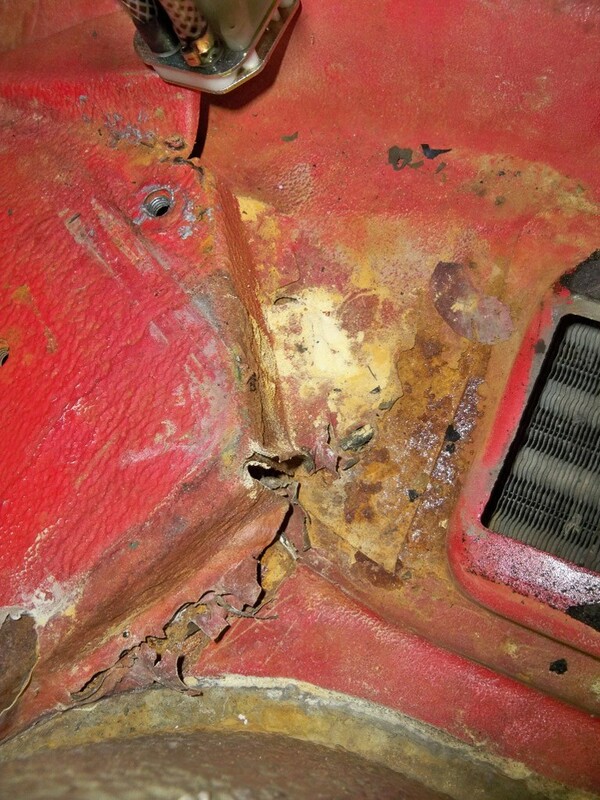 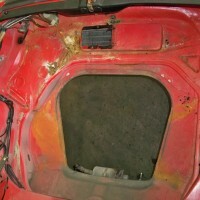 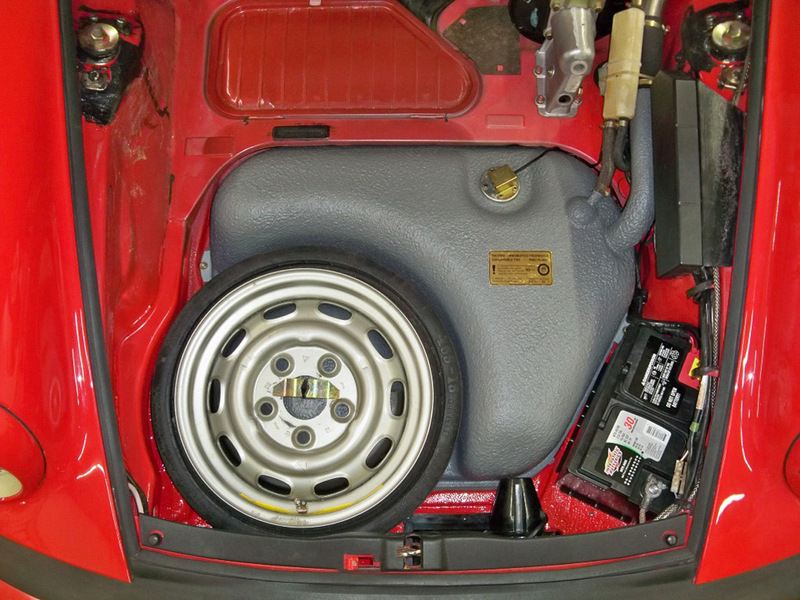 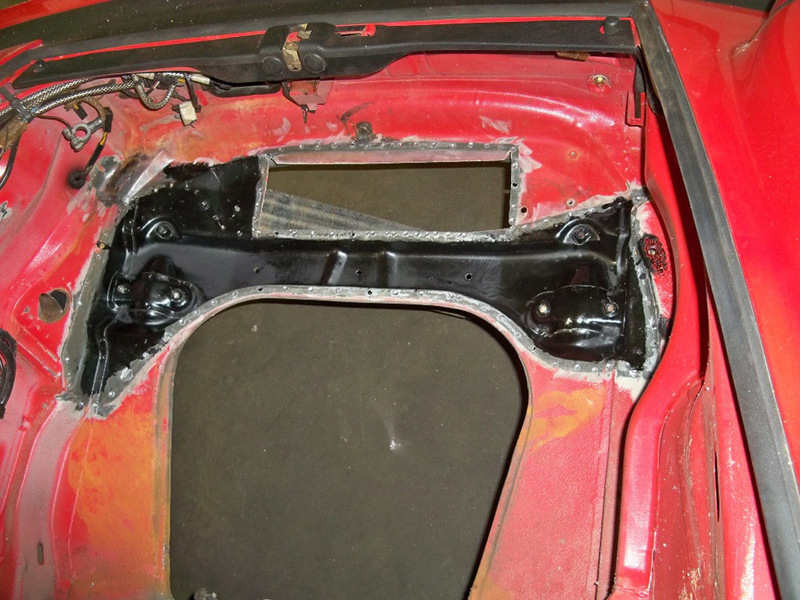 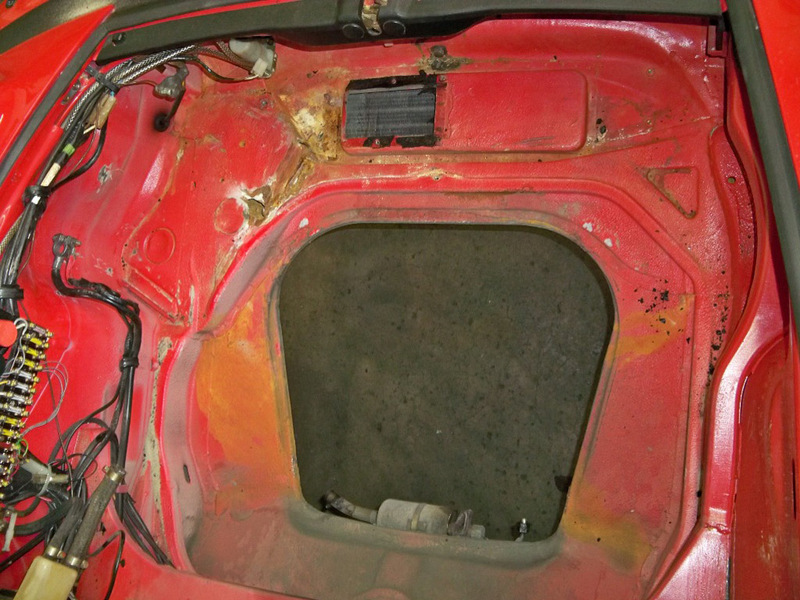 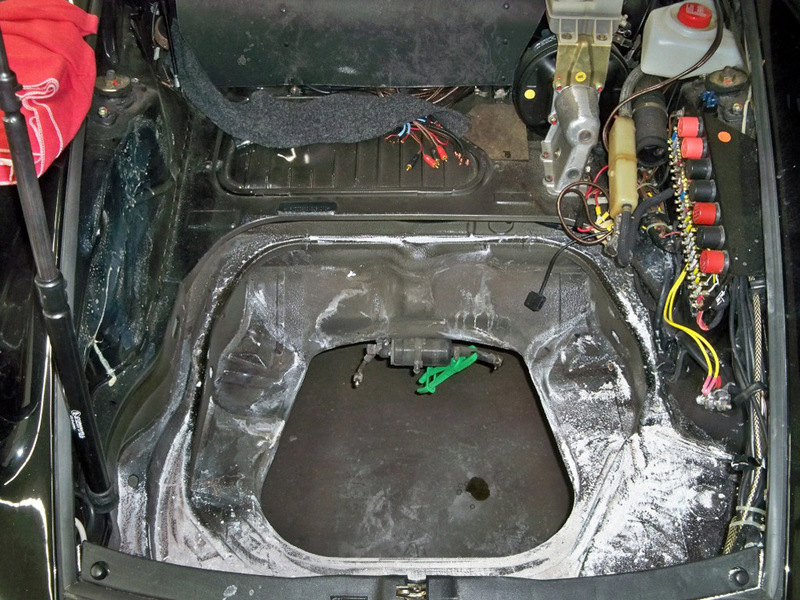 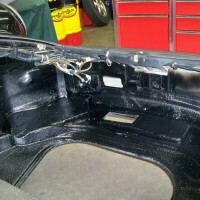 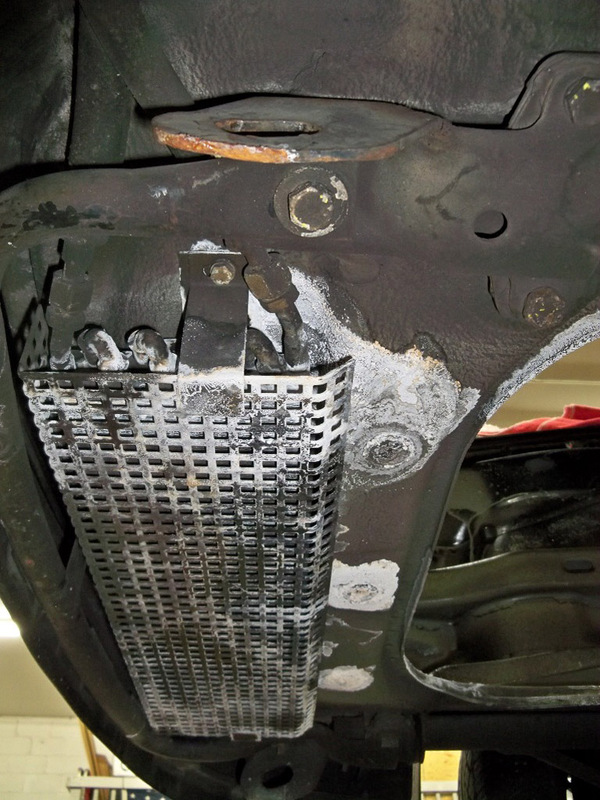 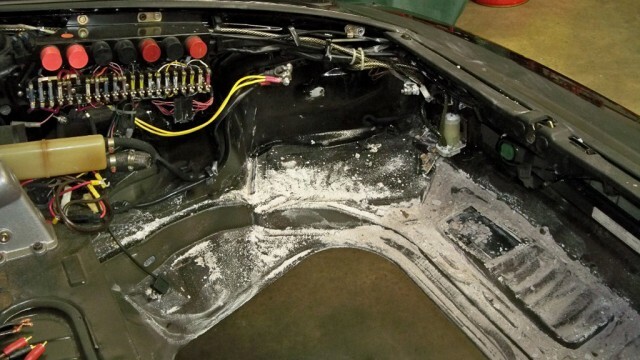 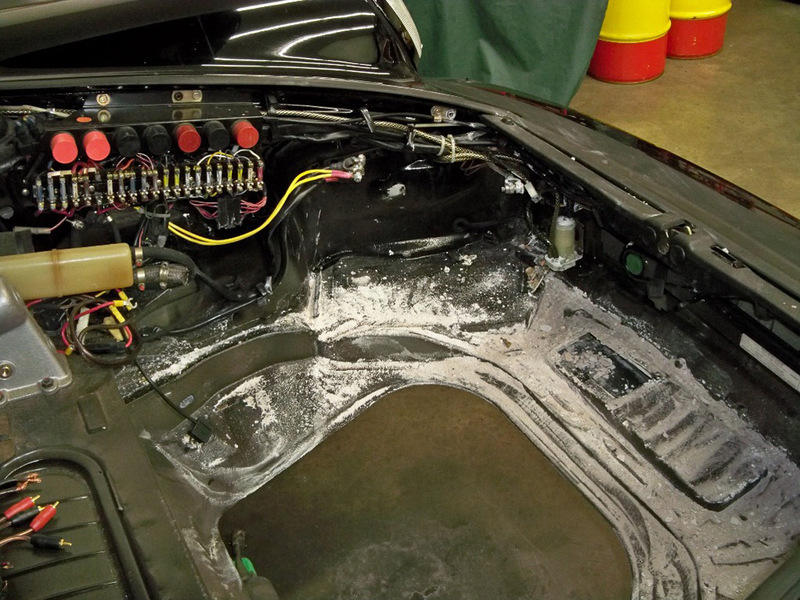 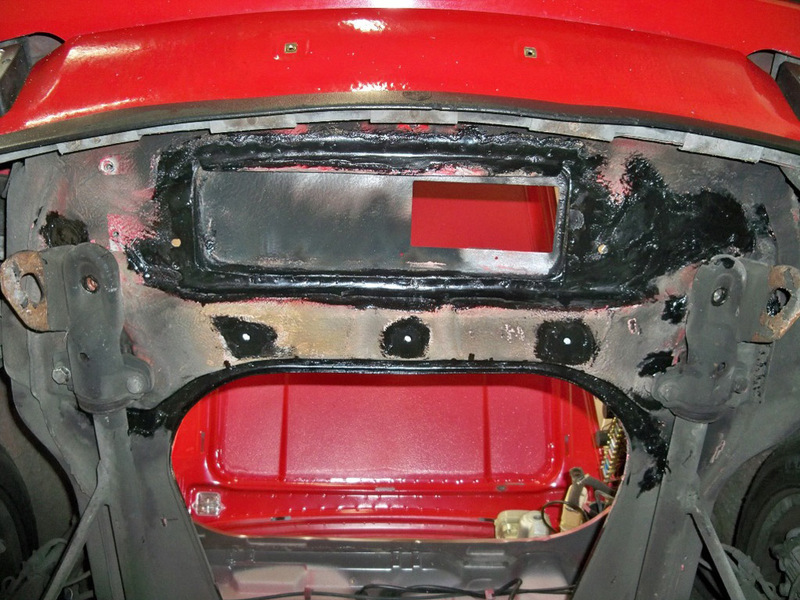 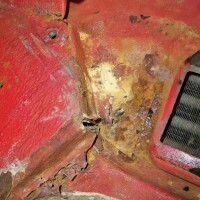 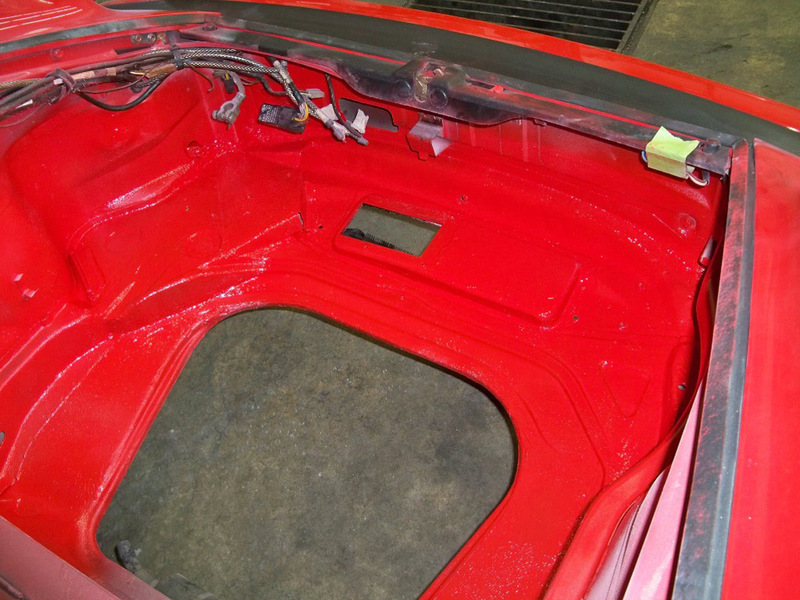 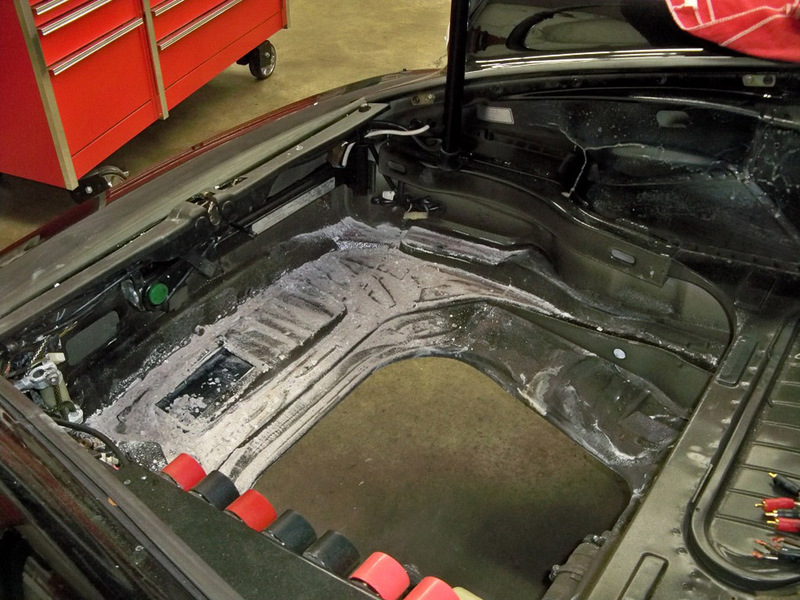 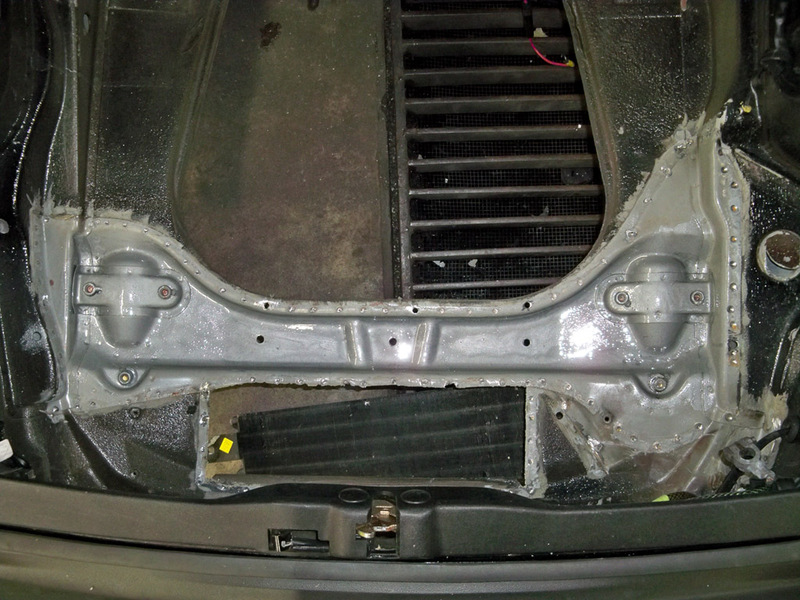 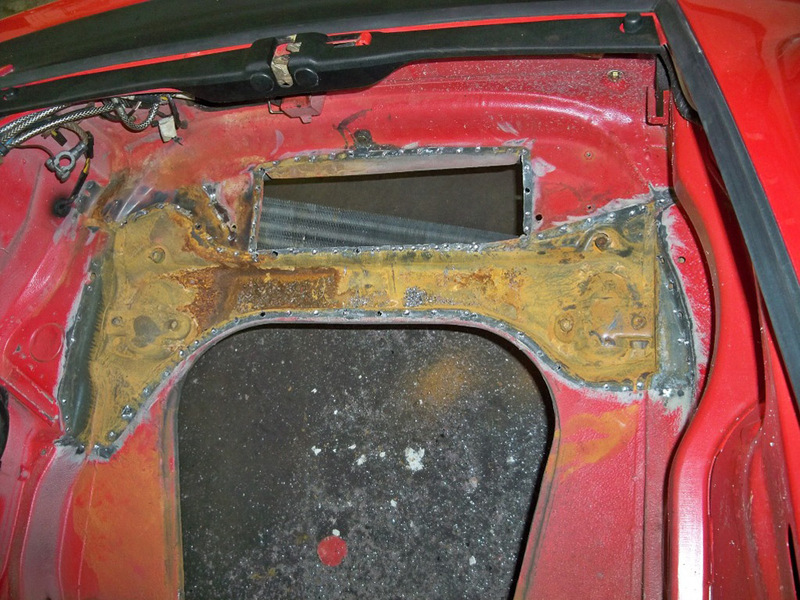 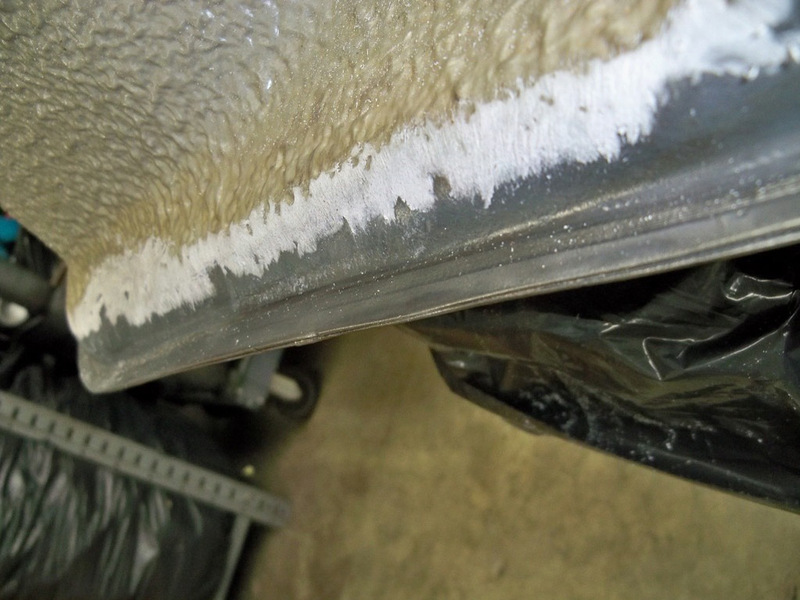 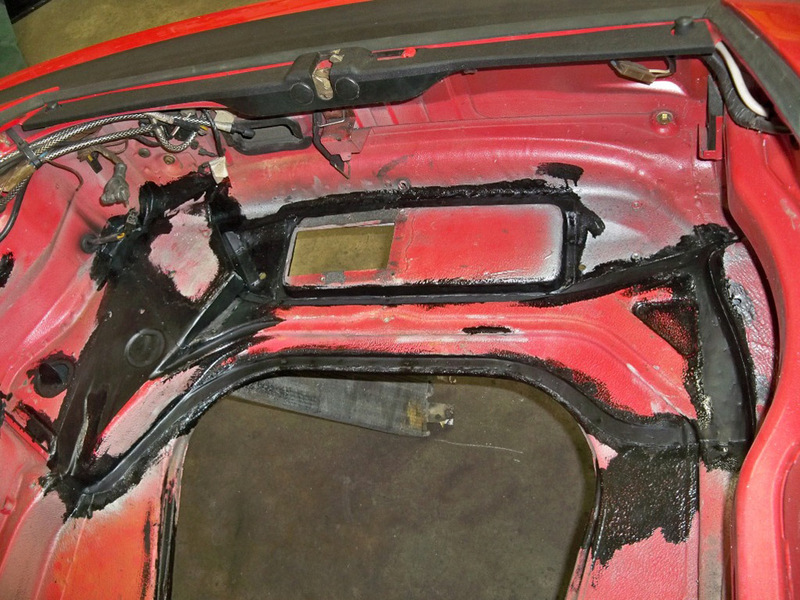 Below is a gallery of two separate battery acid-related rust repairs on Porsches. 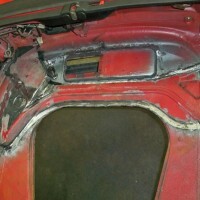 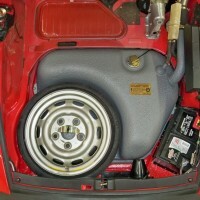 The first vehicle is a M491 Widebody 911 Carrera which experienced battery acid overflow into the trunk many years ago. 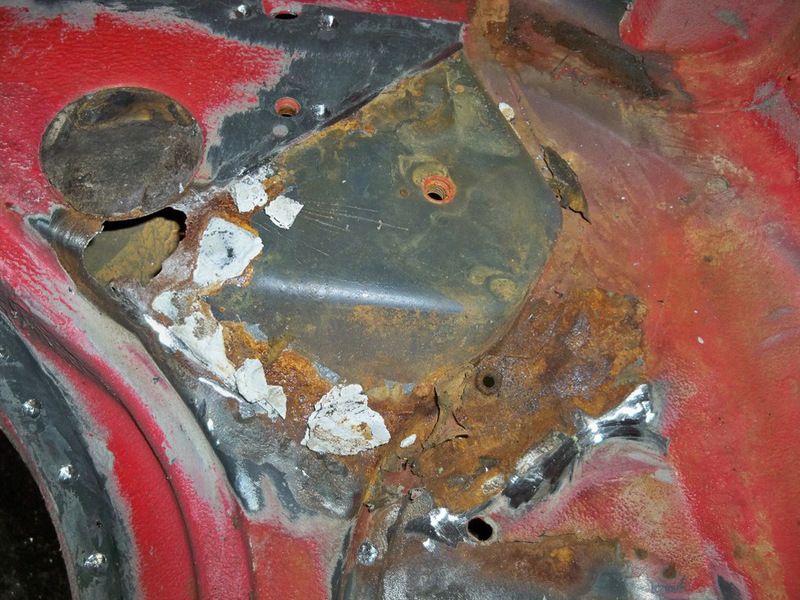 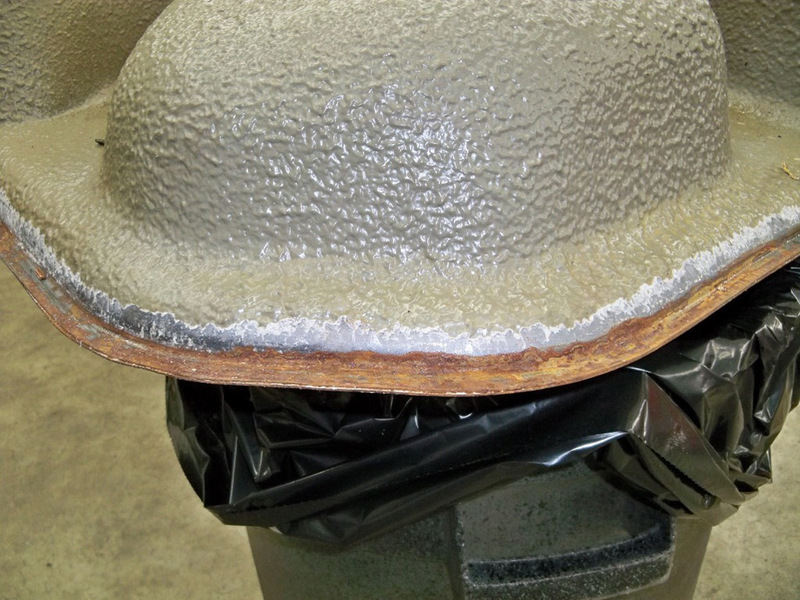 Luckily, the front pan was not extensively rotted and we were able to preserve the original sheet metal. 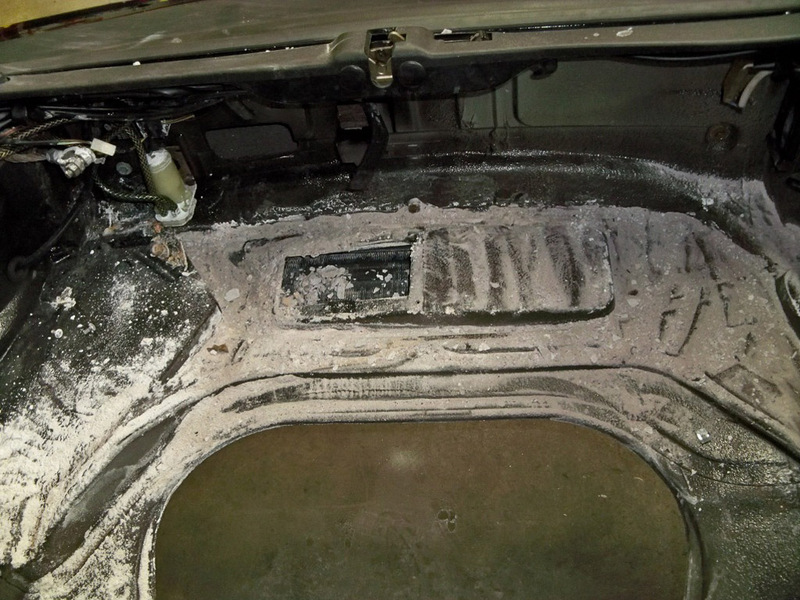 If this were left untreated, the car would need the front pan replaced down the road. 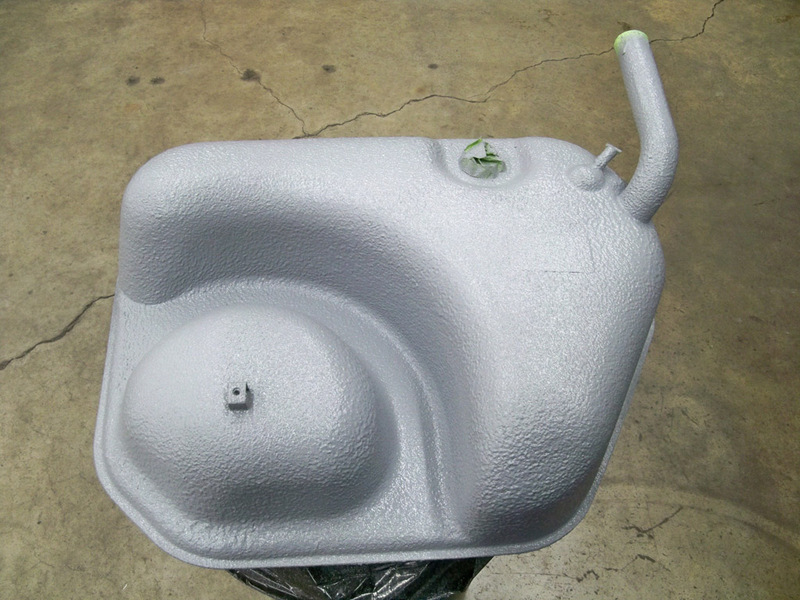 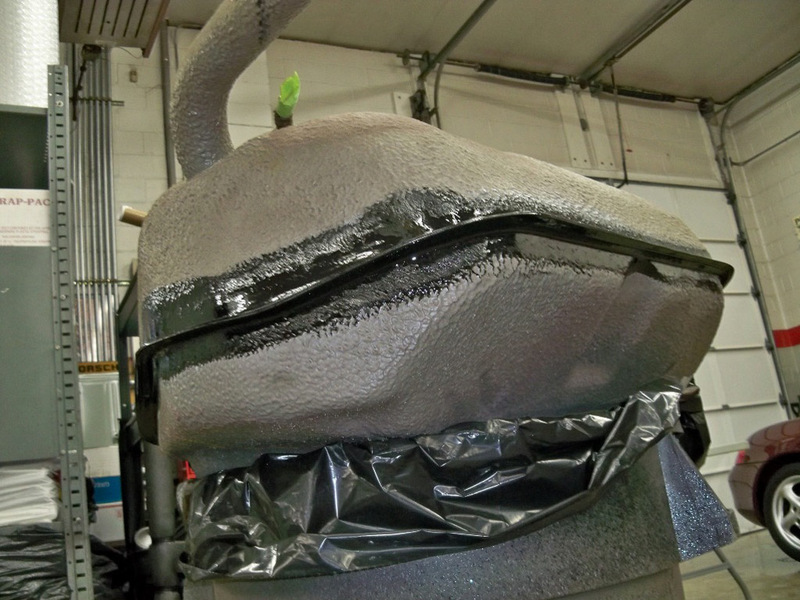 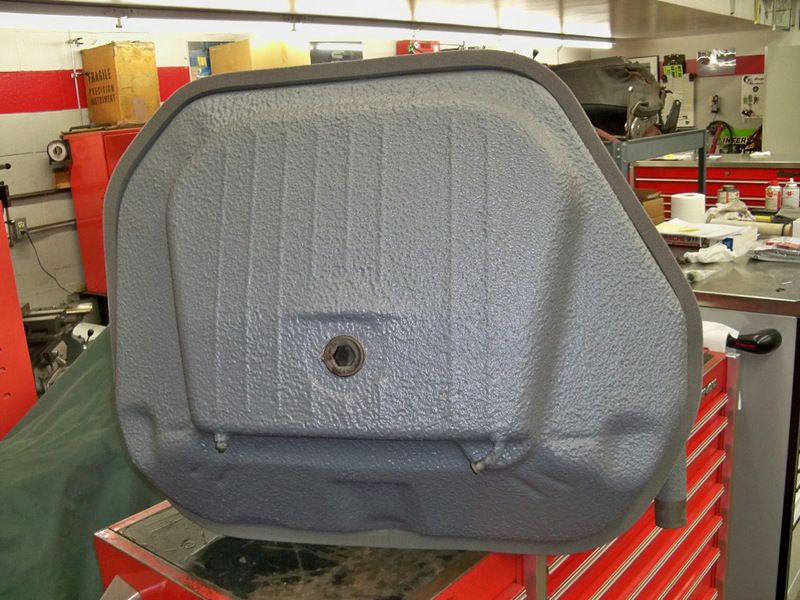 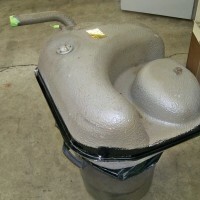 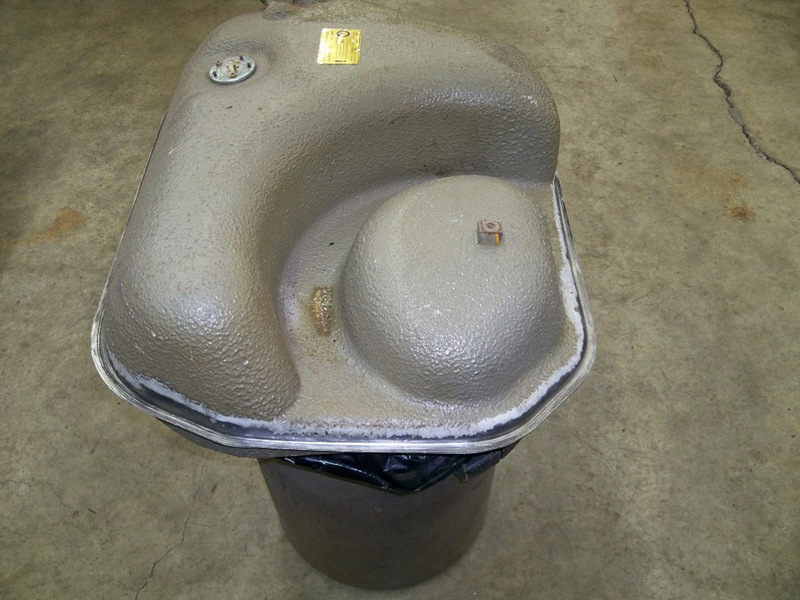 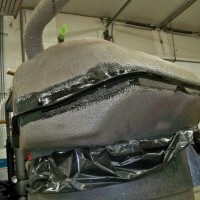 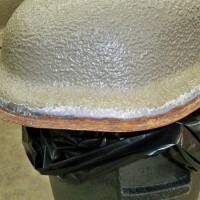 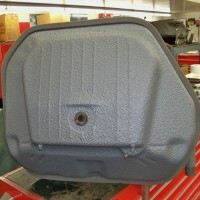 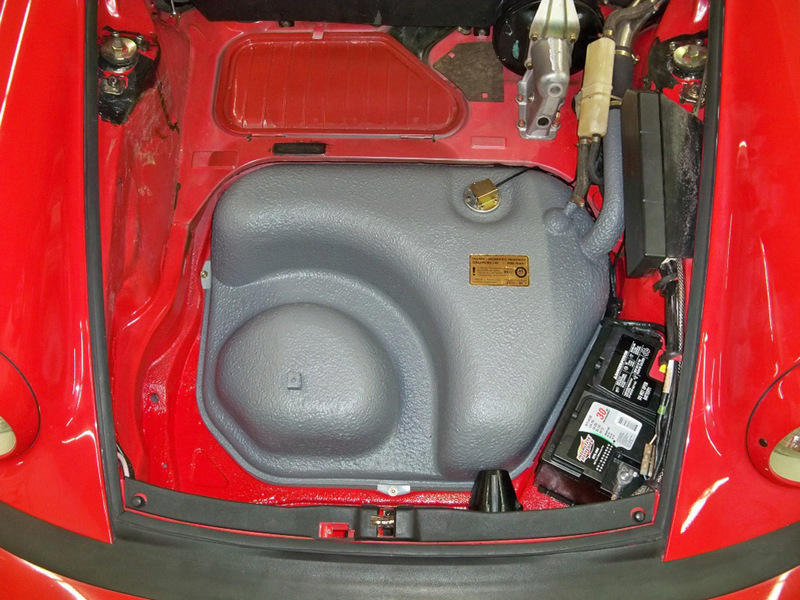 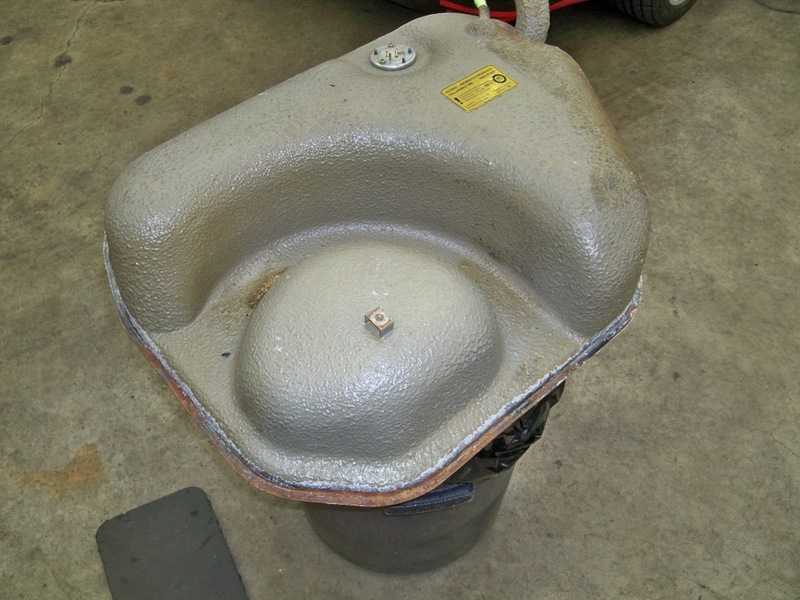 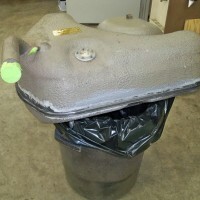 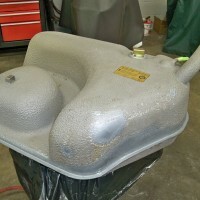 The edges of the gas tank were also affected due to acid absorbing into the foam seal, which resulted in proper treatment and refinishing the tank. 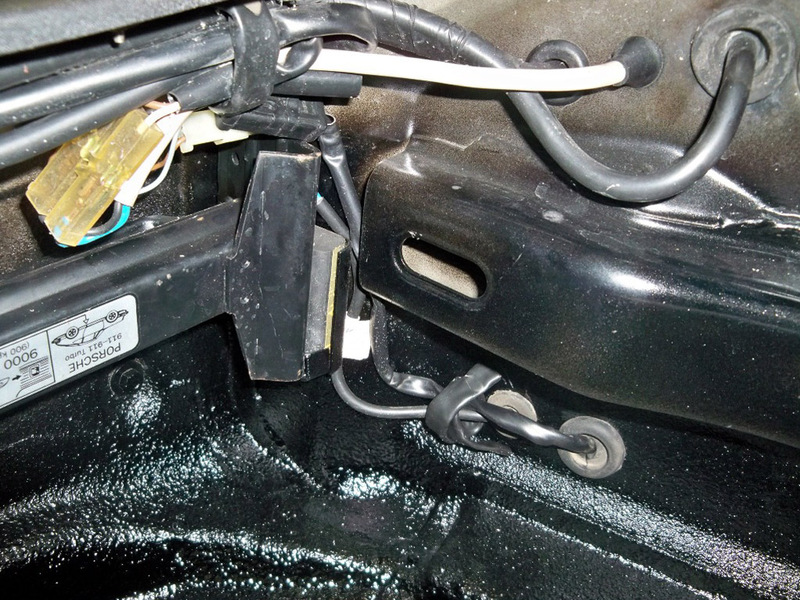 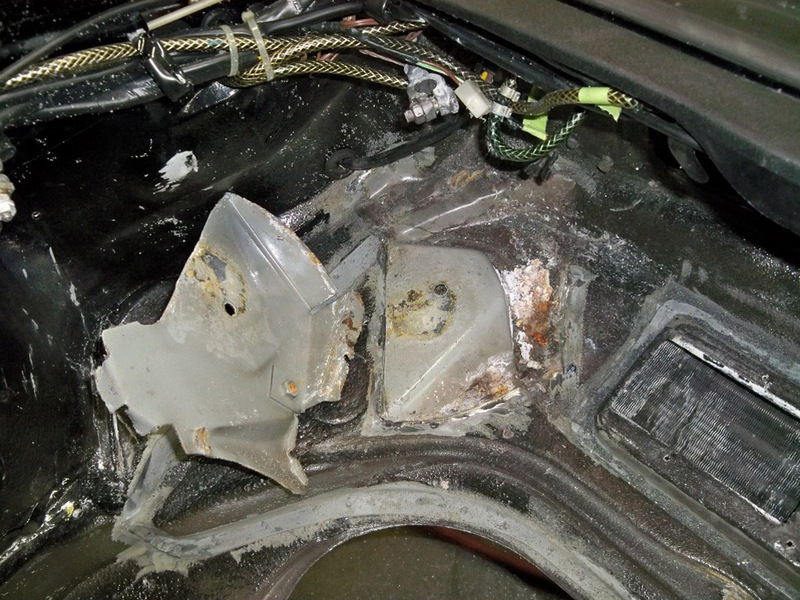 The second vehicle shown is a 930 in which the battery actually exploded inside the car. 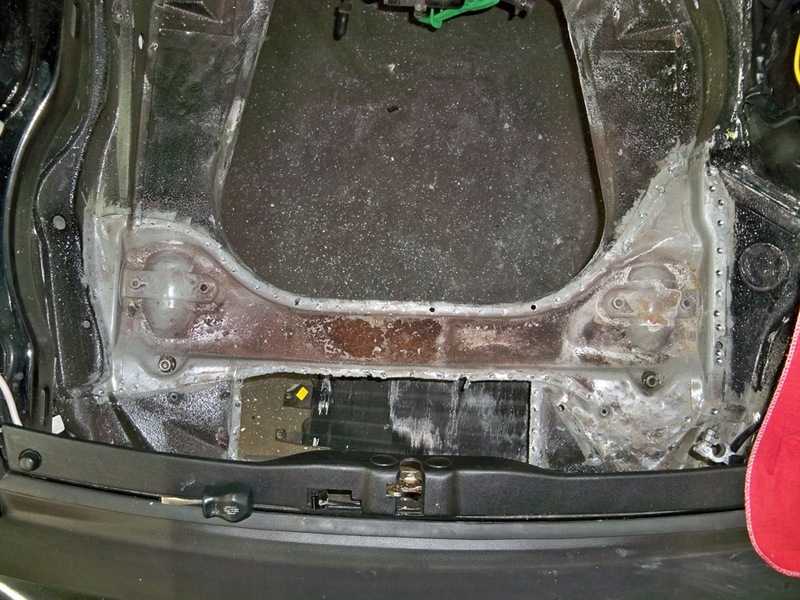 The damage was extensive, as shown in the photos. 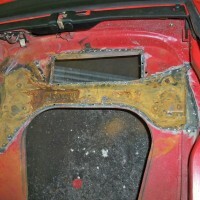 If this would have been left untreated, it would only be a matter of time before the acid began to do extensive damage. 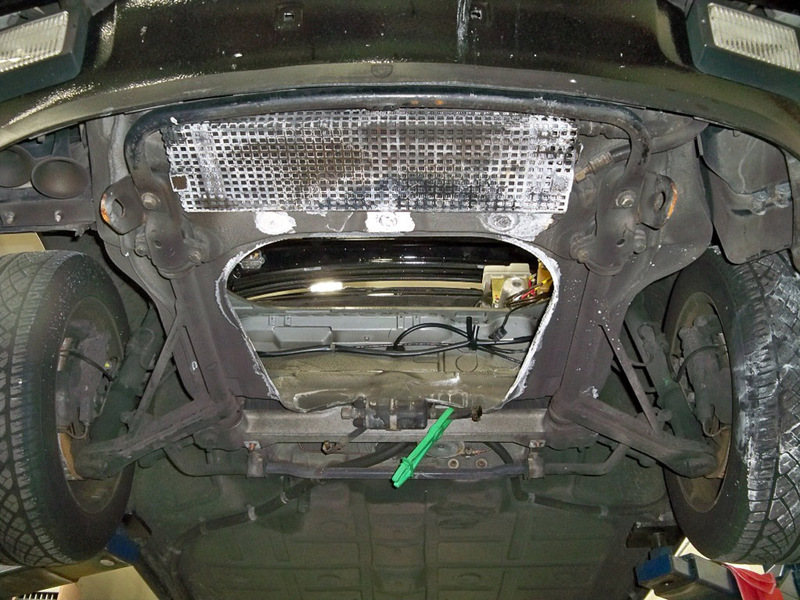 Even though this is certainly not a favorable situation, it can be repaired properly and prevented again by utilizing a gel battery. 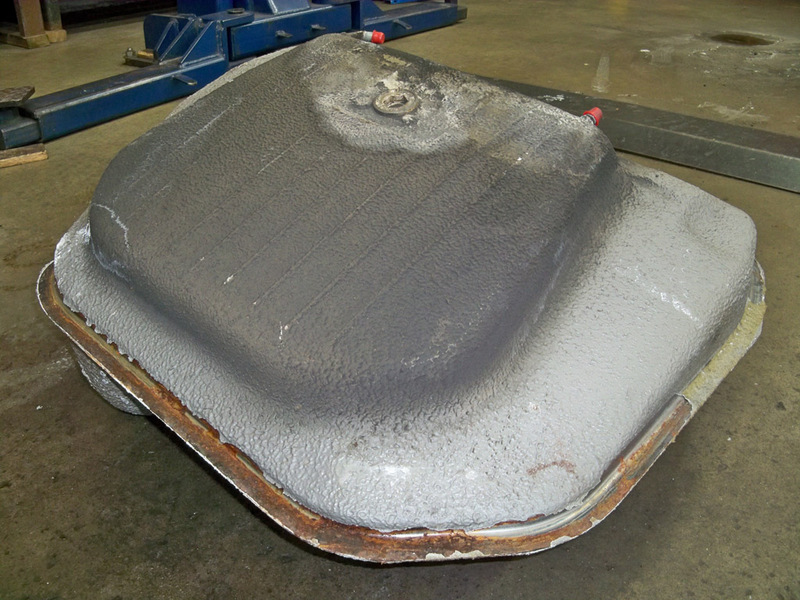 Result of battery acid overflowing and being left untreated for many years. 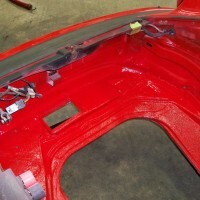 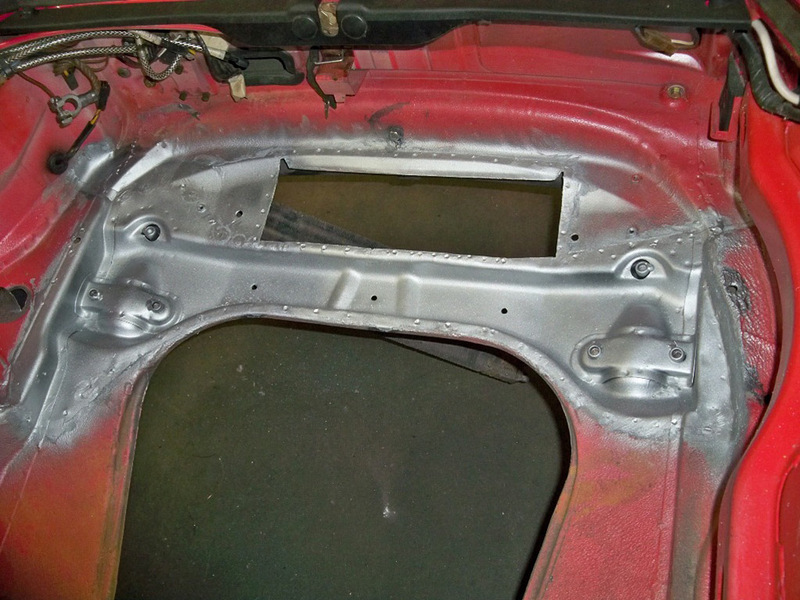 All of the undercoat is removed from the spot welds so they can be properly drilled out. 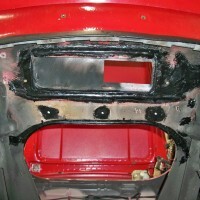 The first battery tray panel has been removed and reveals hidden rust. 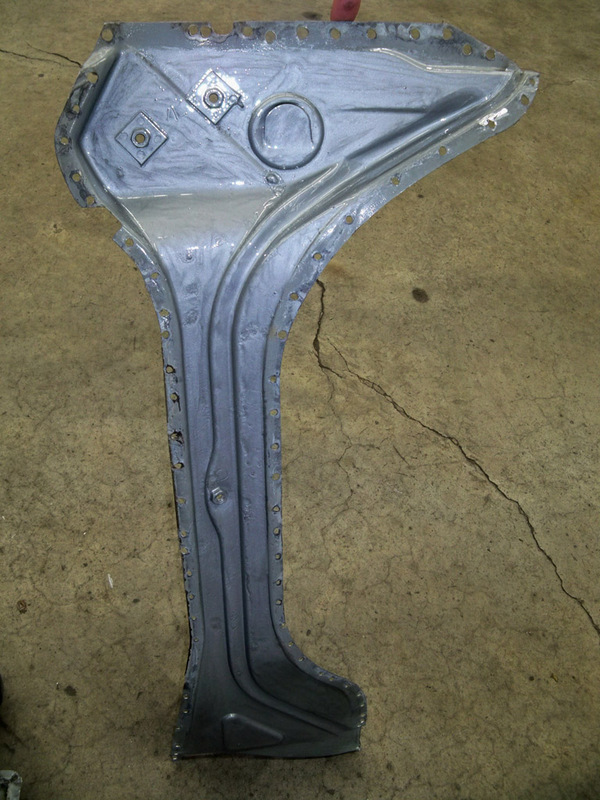 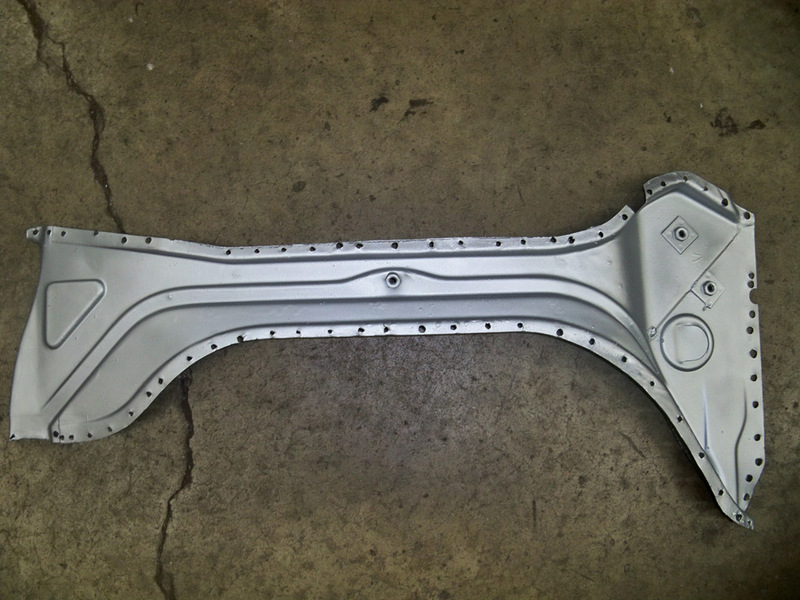 The underside of the fuel tank support panel. 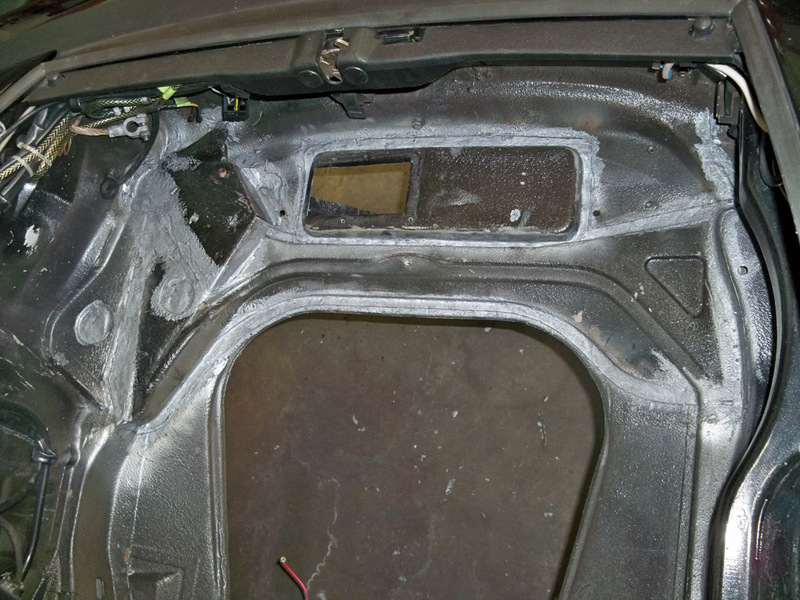 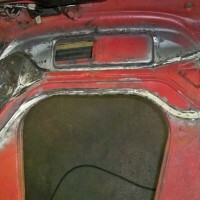 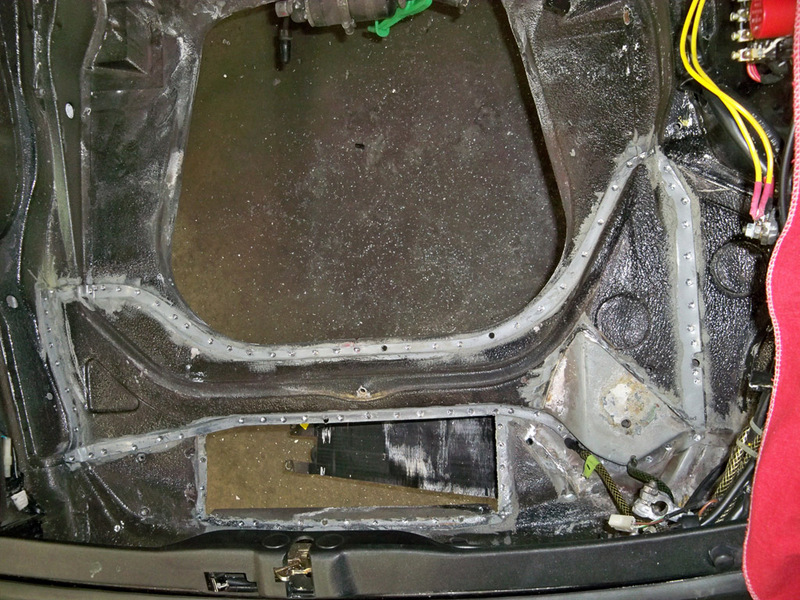 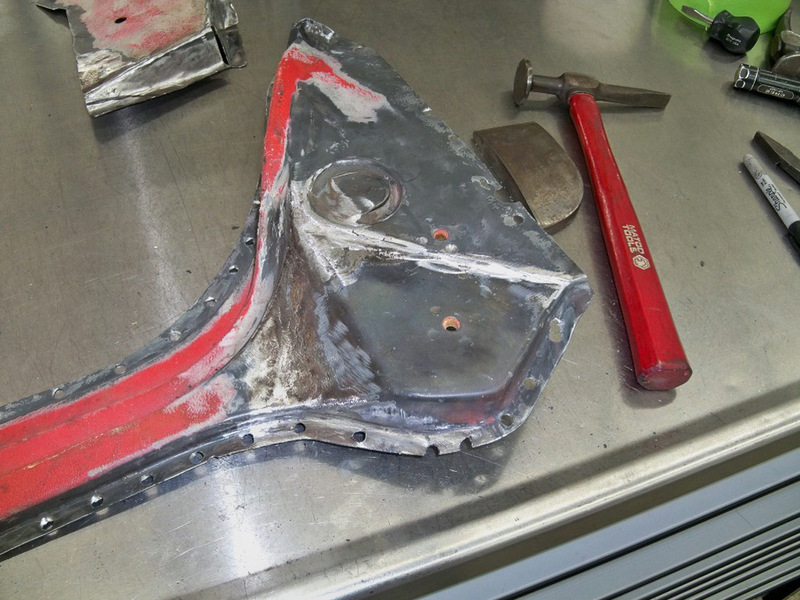 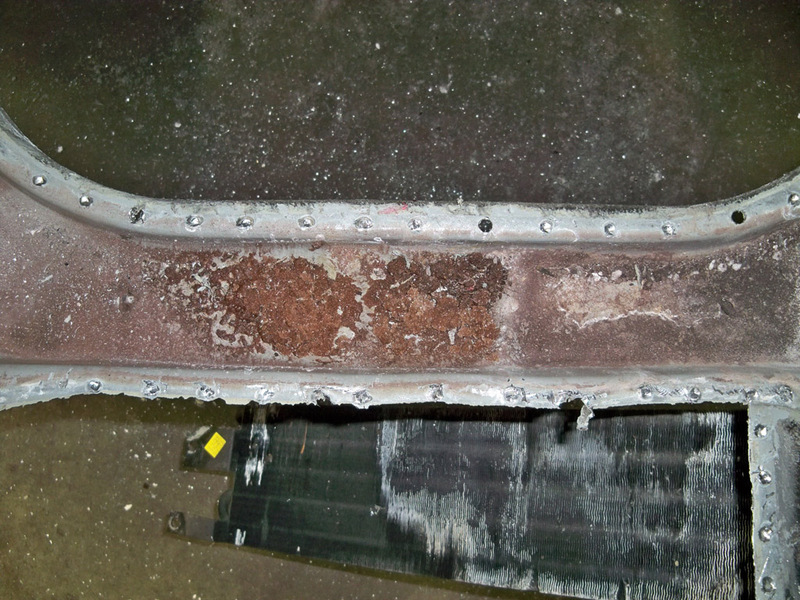 After the fuel tank support panel has been removed, you can see the extent of the acid damage. 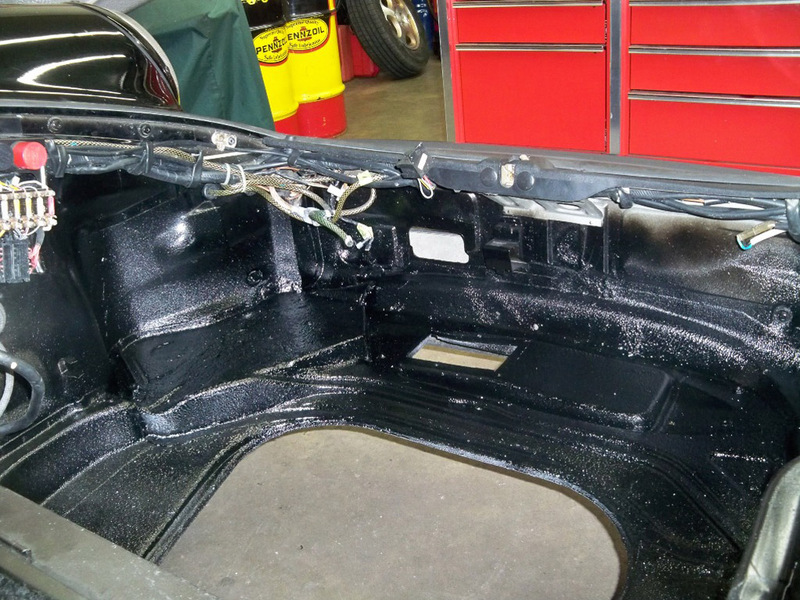 After the metal has been prepped and treated, epoxy paint is applied. 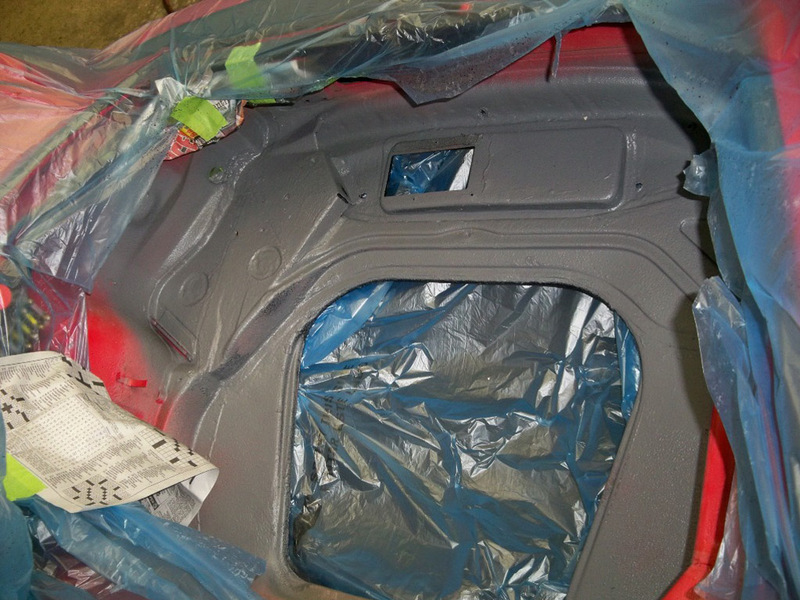 Once epoxy paint has dried and cured, zinc primer is then applied. 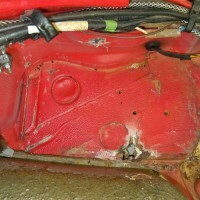 The rust hole in the fuel tank support panel was repaired. 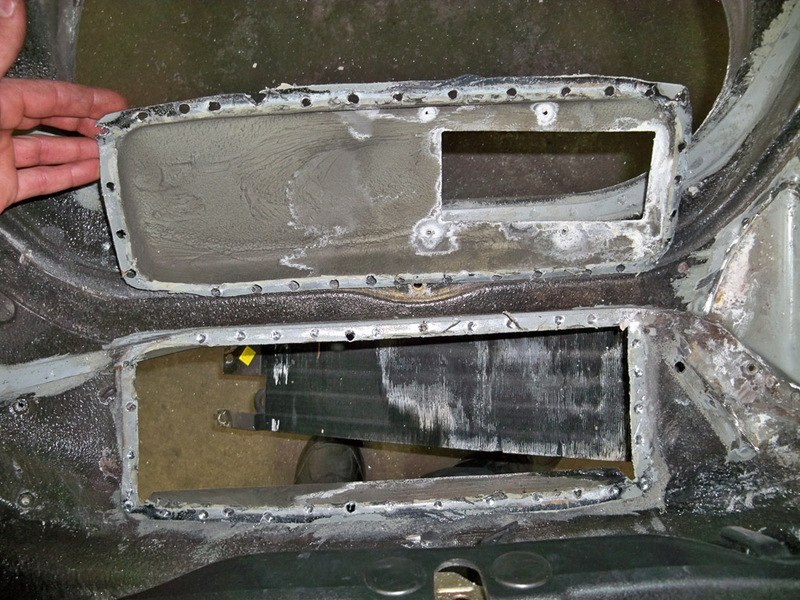 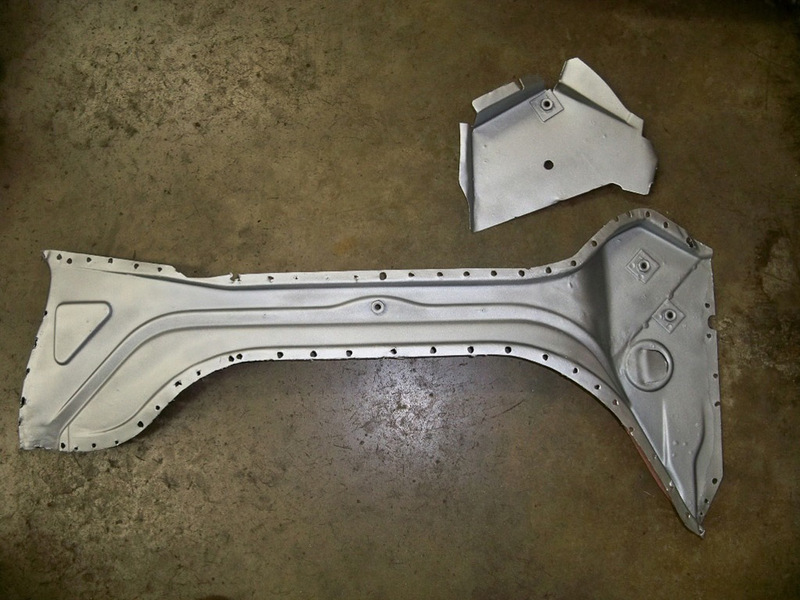 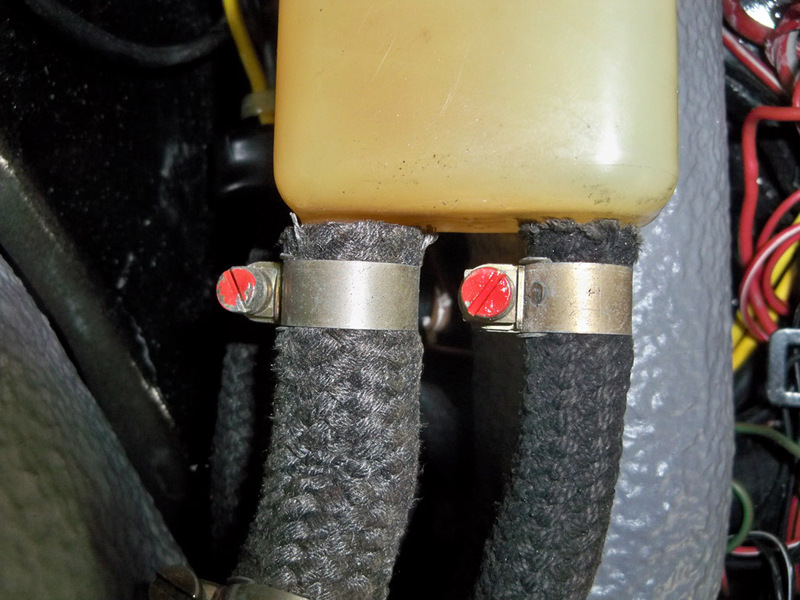 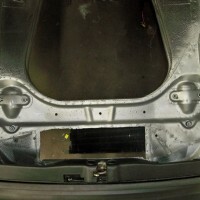 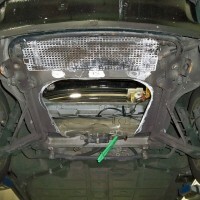 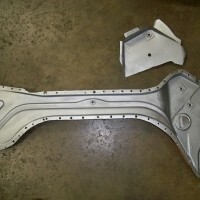 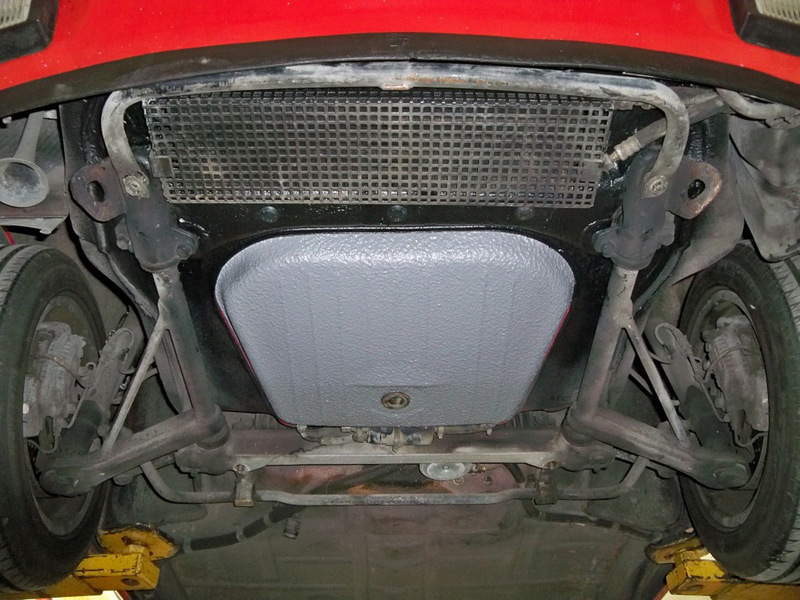 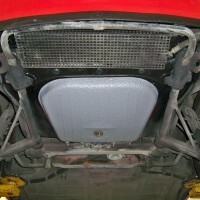 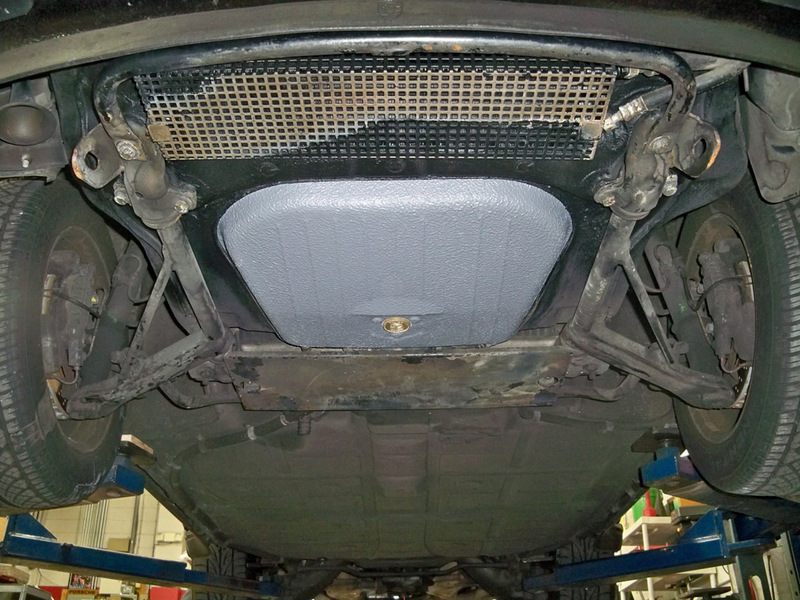 The same treatment is applied to the underside of the fuel tank support panel. 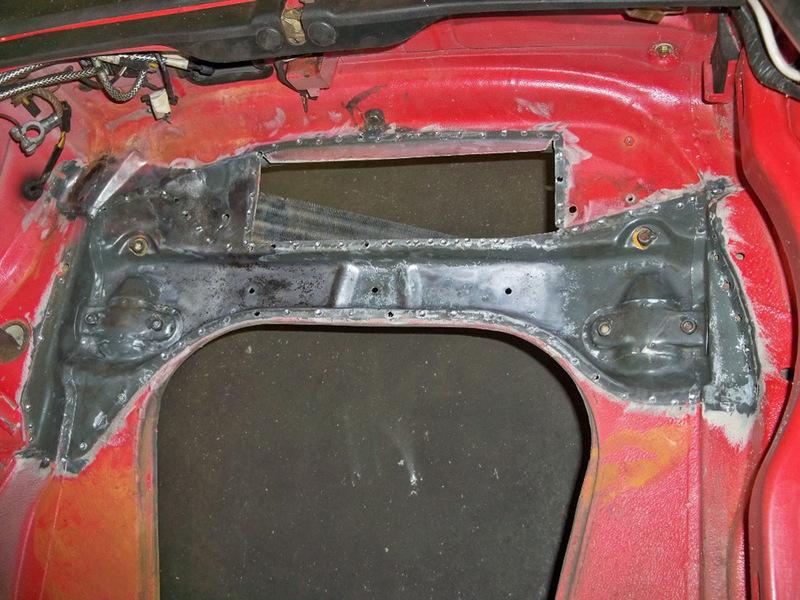 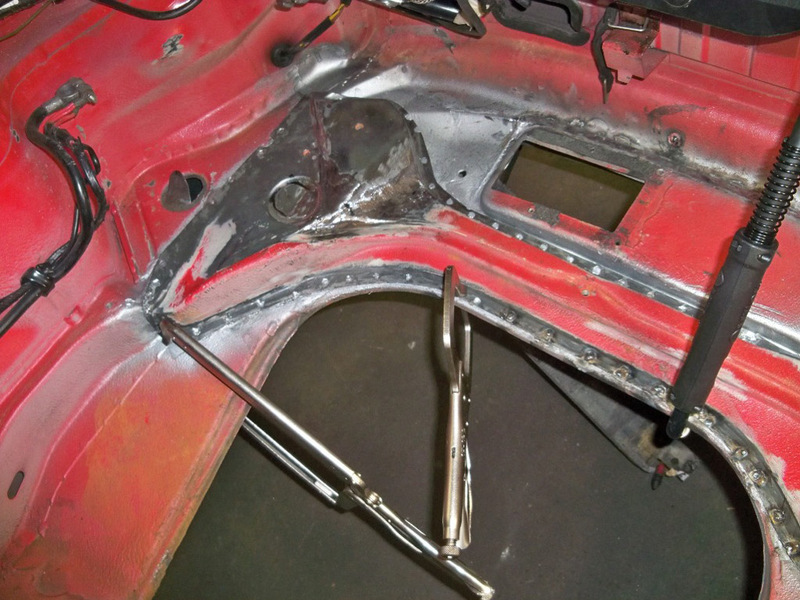 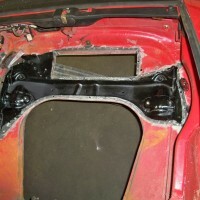 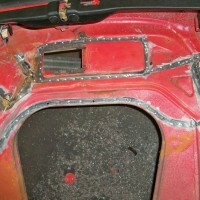 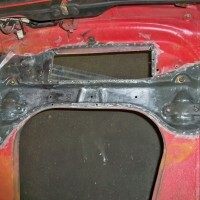 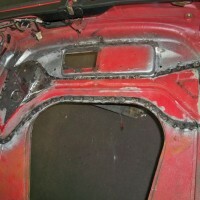 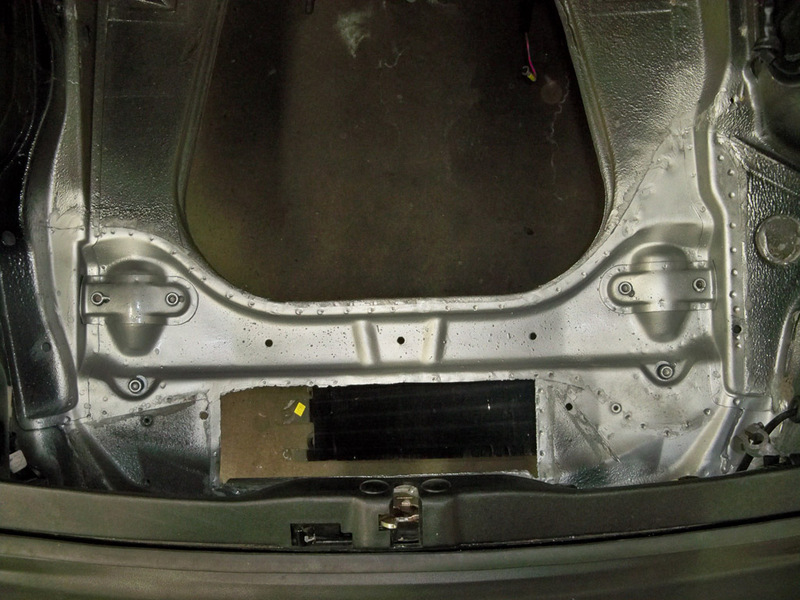 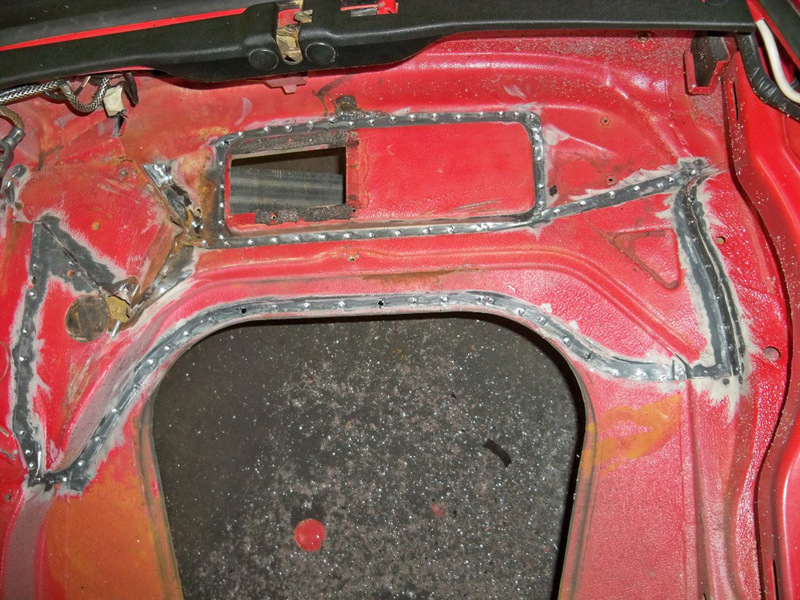 Panels are then properly fitted and welded back in place. 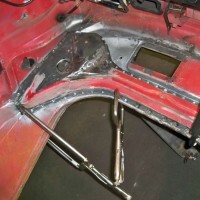 All of the welds are then ground down. 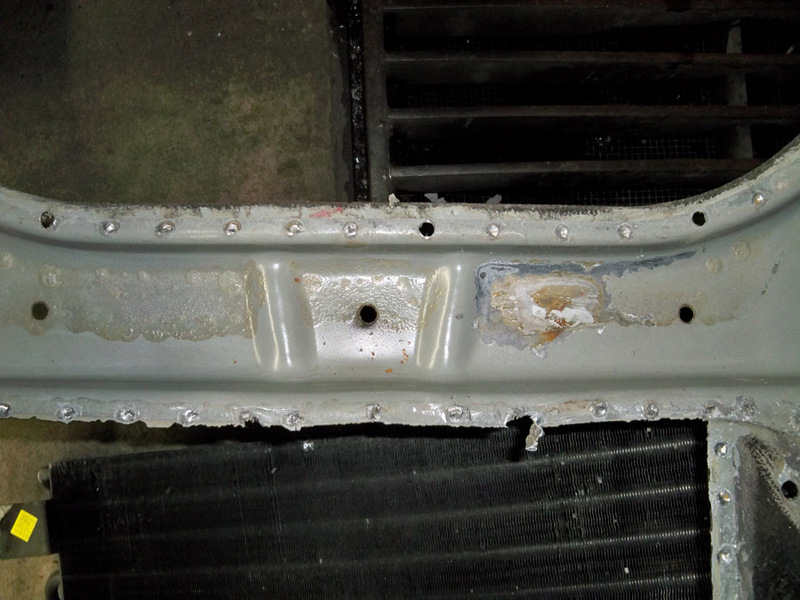 This section has been epoxy painted because once the other panel is in place, it cannot be accessed for proper treatment. 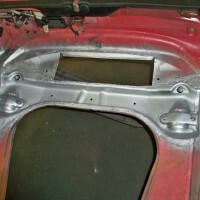 All panels are welded back in place. 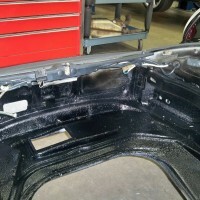 Any undercoating that has been compromised has been removed and the metal has been epoxy painted. 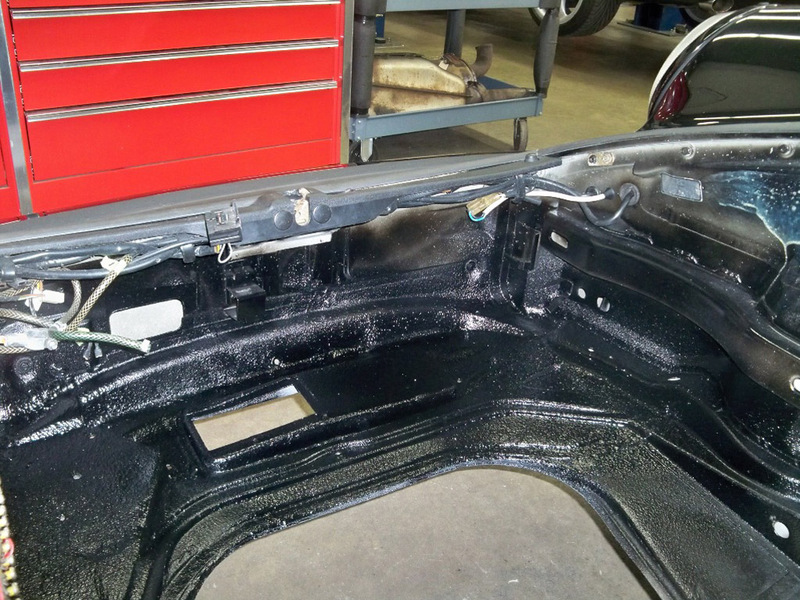 All welds and bare metal have been epoxy painted and then seam sealed to ensure that any moisture cannot gain access to the metal. 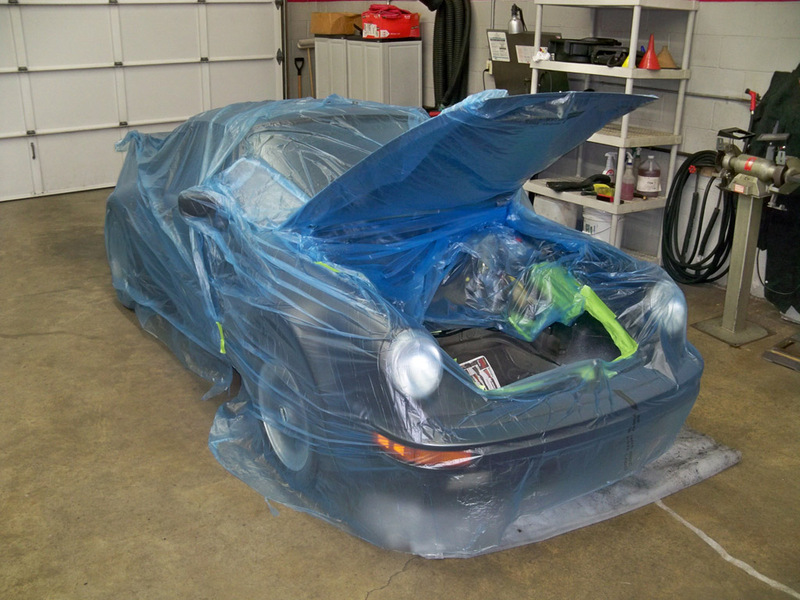 The car is then completely taped off and covered before undercoating and paint is applied. 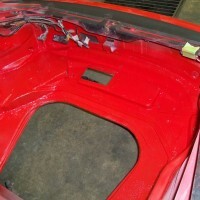 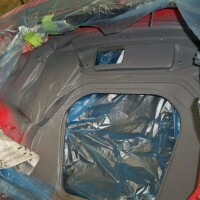 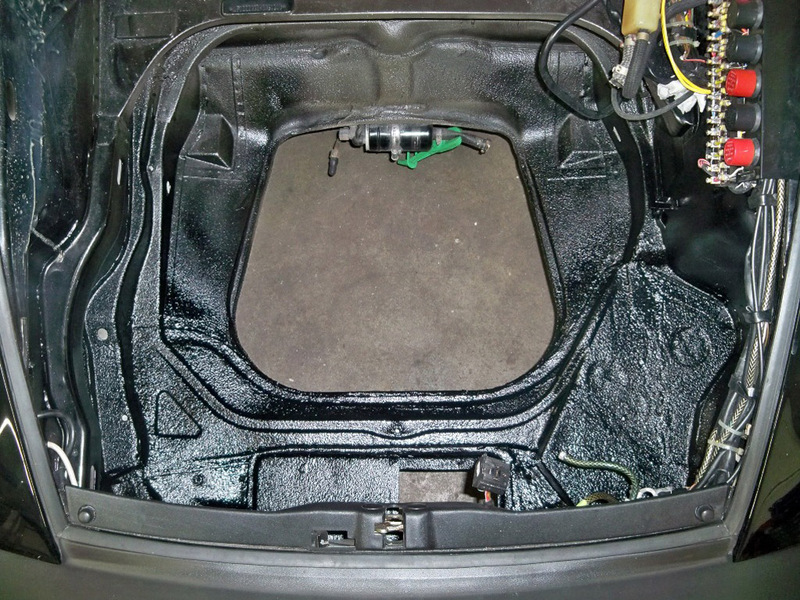 The trunk has been undercoated and blended. 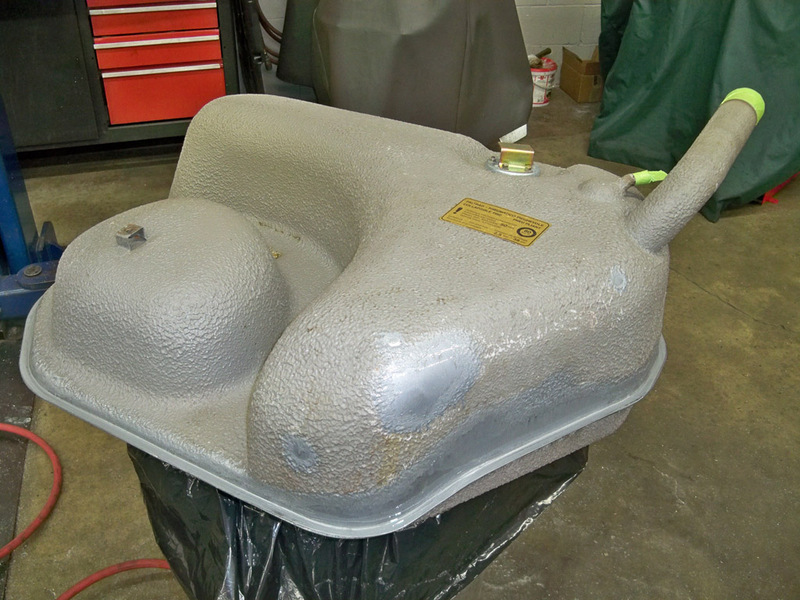 The gas tank is also in need of treatment, as the acid absorbed into the seal and undercoating and began to rust the metal. 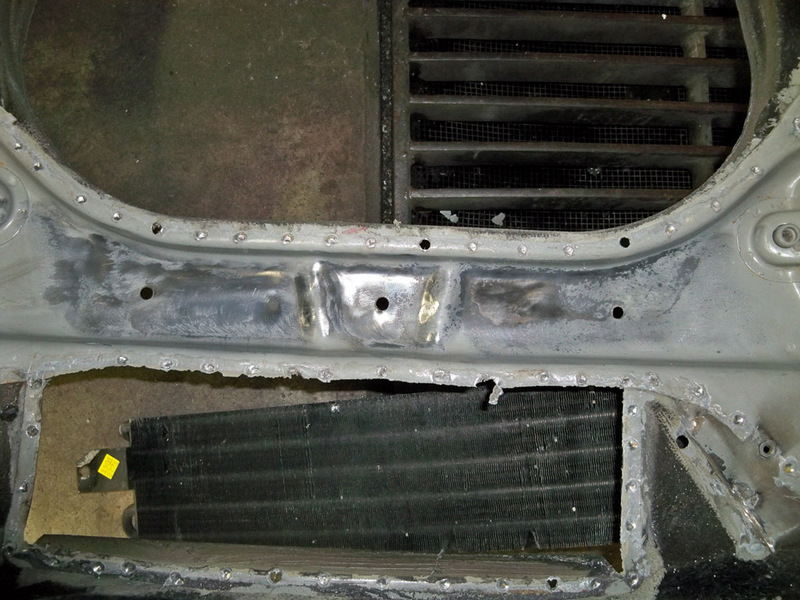 We removed the undercoating up to clean metal to ensure all compromised metal is properly treated. 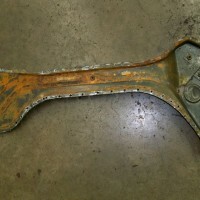 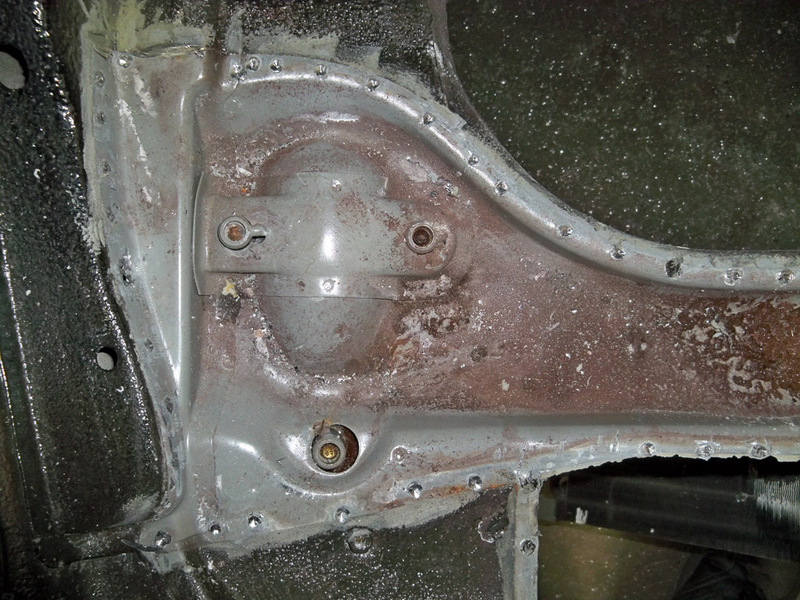 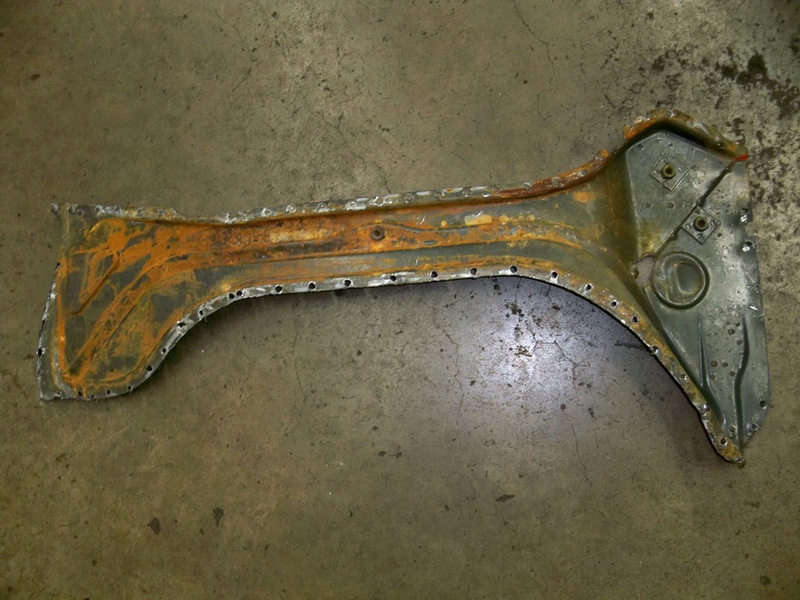 The rust is then removed and treated. 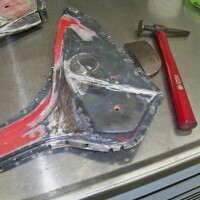 Epoxy paint is then applied. 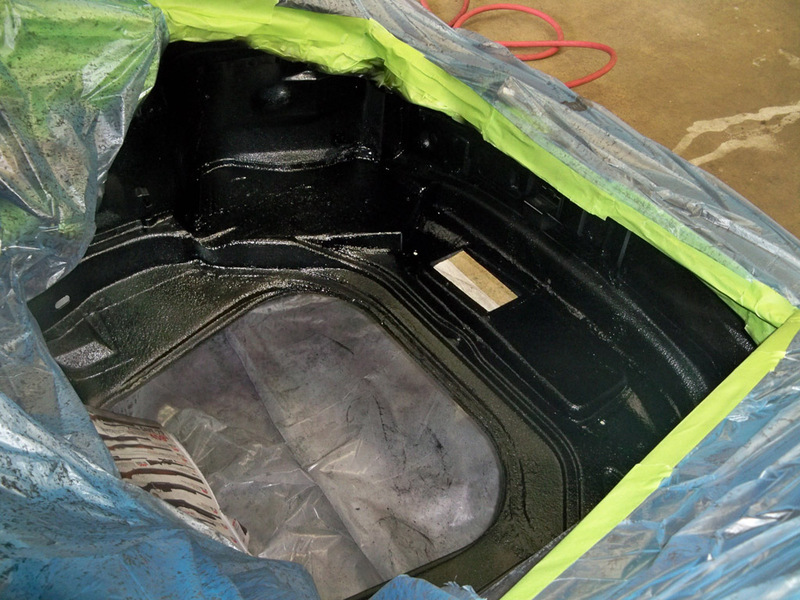 The undercoating is then applied and blended, and a new fuel tank seal is applied. 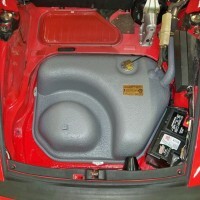 The fuel tank is then installed back into the car. 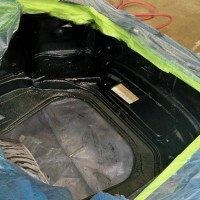 The underside is also finished and properly blended with undercoating. 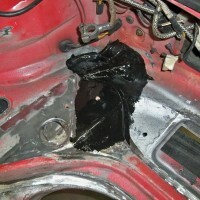 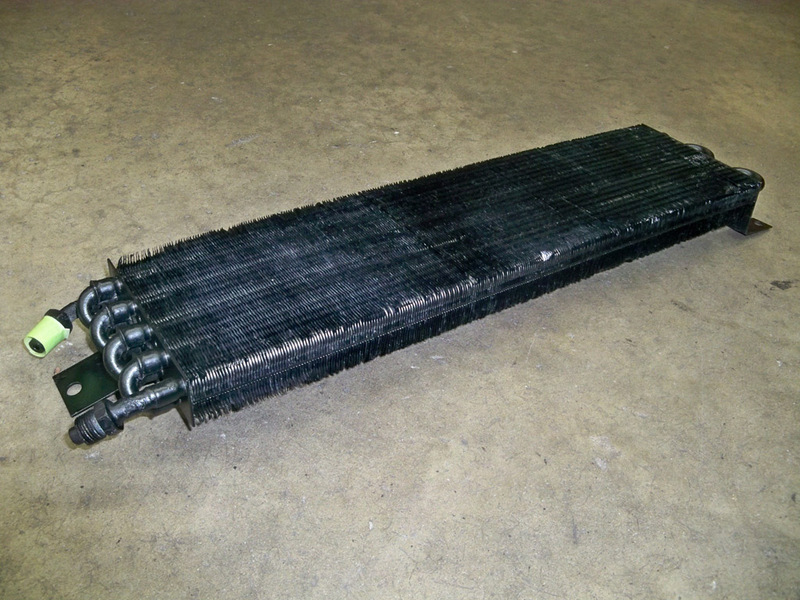 This extensive damage is the result of an acid battery exploding. 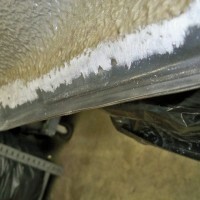 This damage occurred after only two weeks. 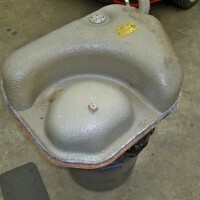 The AC condenser was treated and refinished. 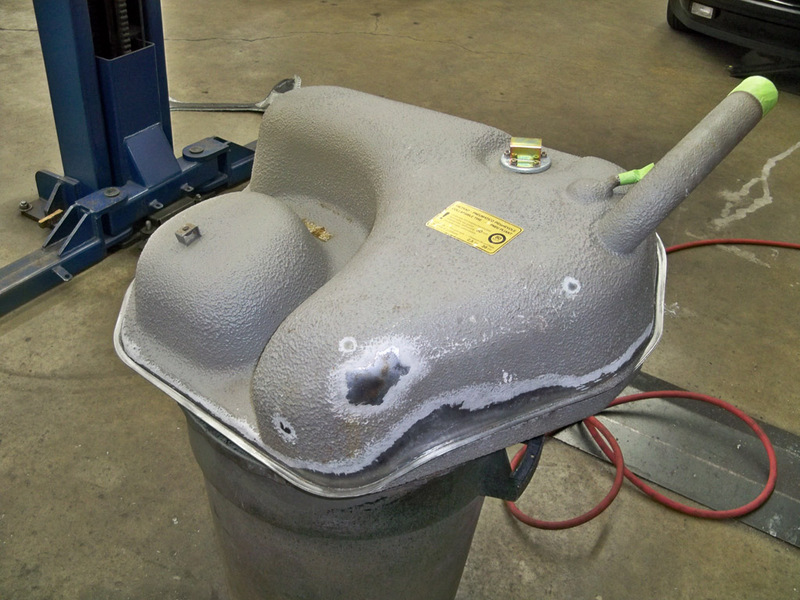 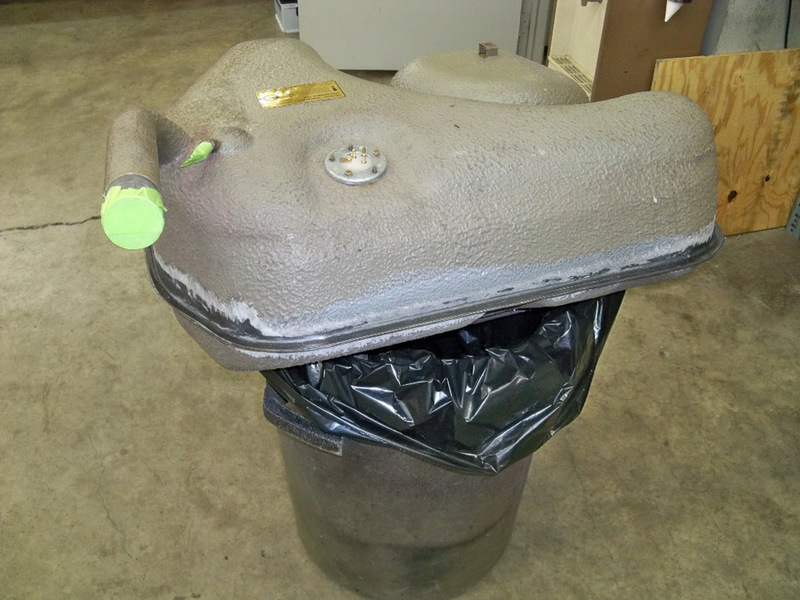 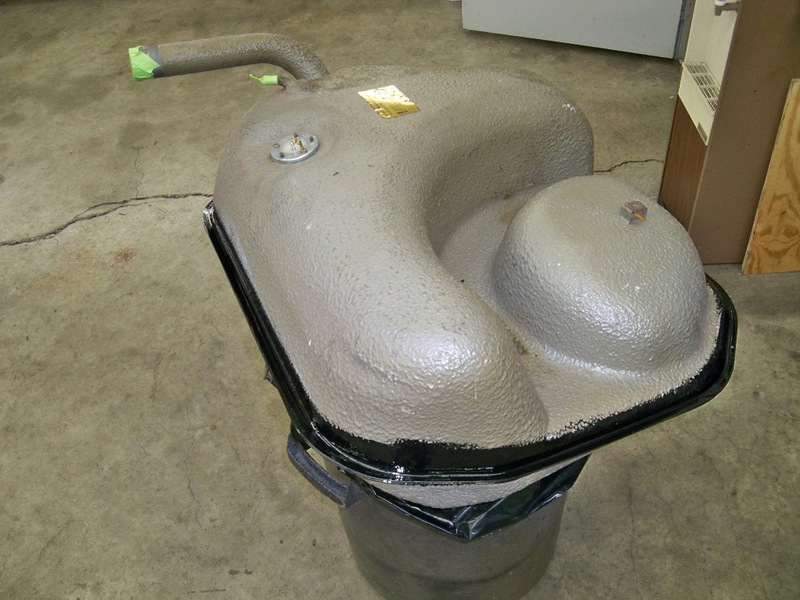 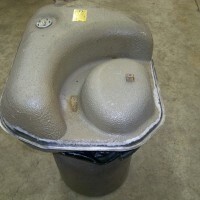 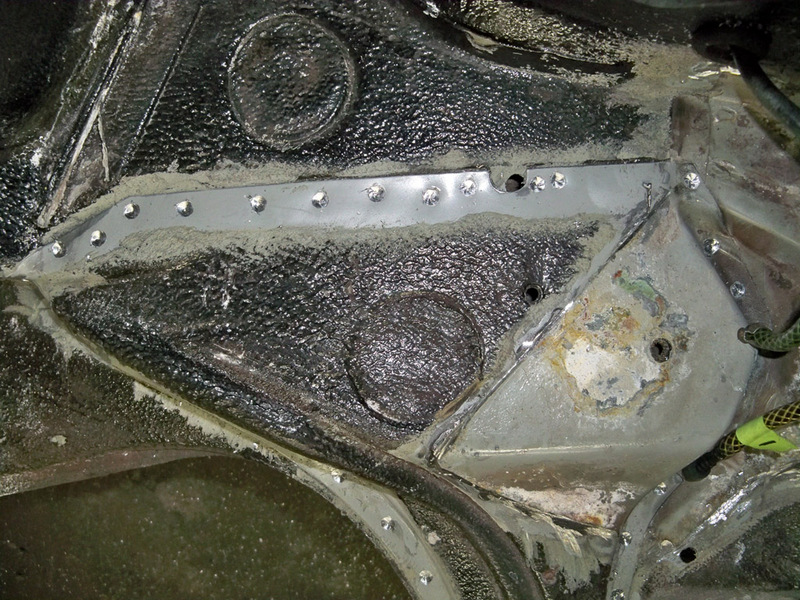 The fuel tank also suffered from the acid corrosion.